Today was a serious putting food away day. I have to lead with the most perishable item, this Dutch apple pie that Martin made with a jar of apple pie filling that didn’t seal. 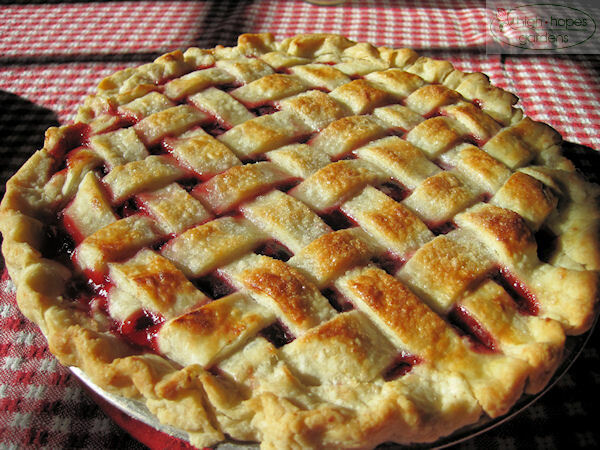 But 11 others did seal for winter-time fruit pies. 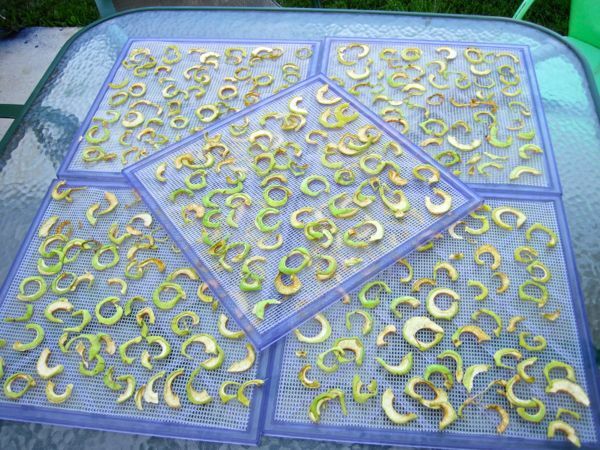 A dehydrator batch of dried apples. 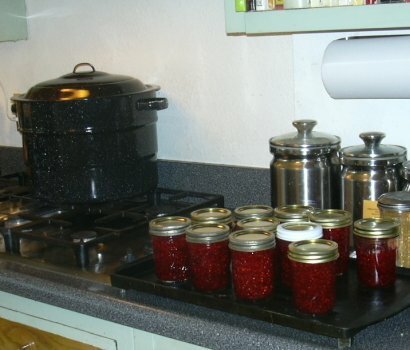 A couple of canner loads of various sizes of blackberry applesauce. 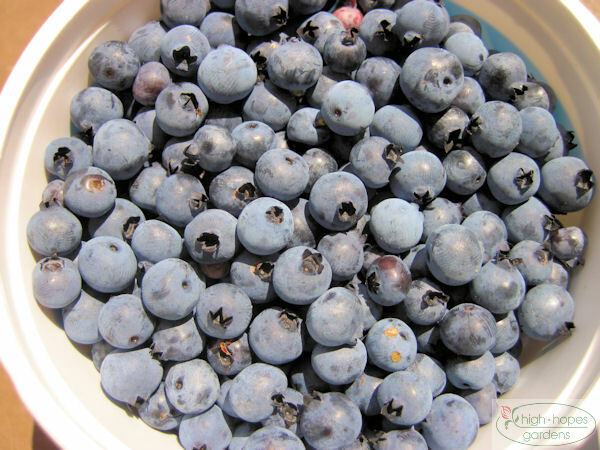 For blackberry fans, this combination, with a few splashes of lemon makes a great applesauce. Plus three more gallons of peeled, sliced apples went into the freezer. 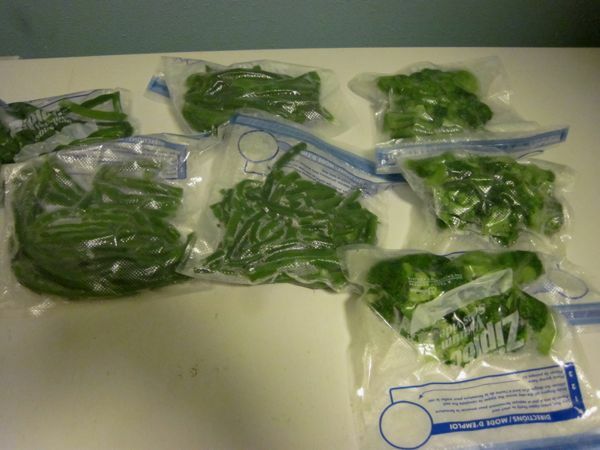 Almost as an afterthought, some beans and broccoli were blanched and frozen. In case none of this tastes good, a liter of brandy soaks up some sugar and blackberry to fend off winter colds! With the abundance of apples, after freezing many bags, drying many trays, now we’ve moved onto making pie filling. Here’s a jar that didn’t seal appropriately sitting in front of the apple tree. Sometimes the headspace is tricky since the filling is so sticky and air bubbles get caught. This one didn’t seal, so we’ll have to eat it soon -darn! 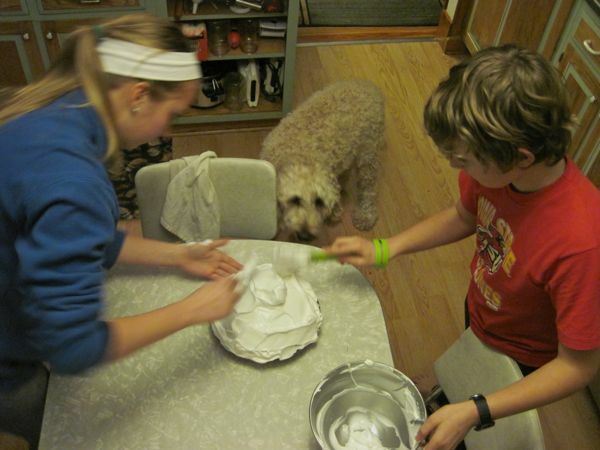 February 1, 2013 – Baked Alaska! It’s cold and hard to do much outside, so what better than throw some ice cream in the oven at 425 degrees. 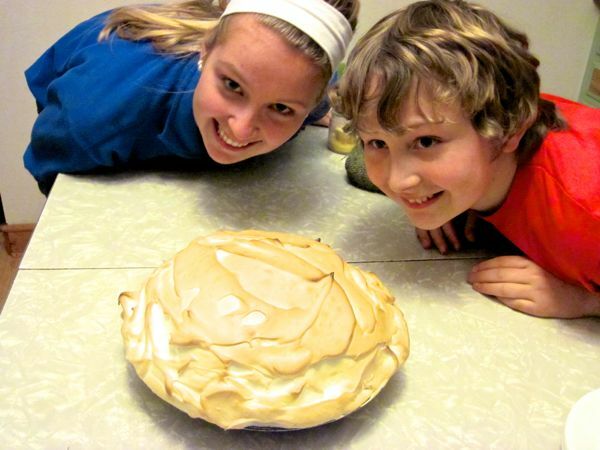 Martin and Emma made a Baked Alaska recently. 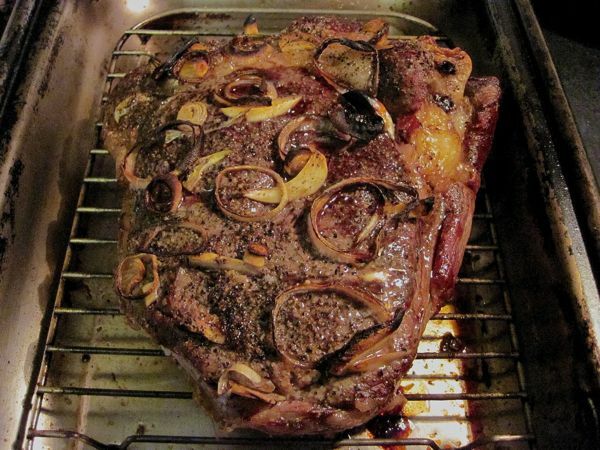 This the finished product, seconds before slicing it open. 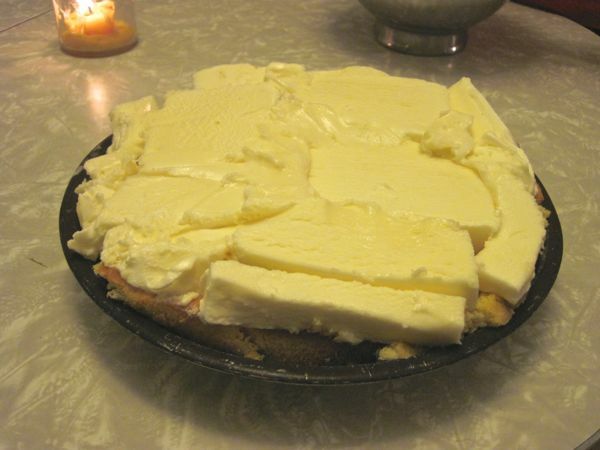 First step is to make a cake, throw it in the freezer, then top it with ice cream. 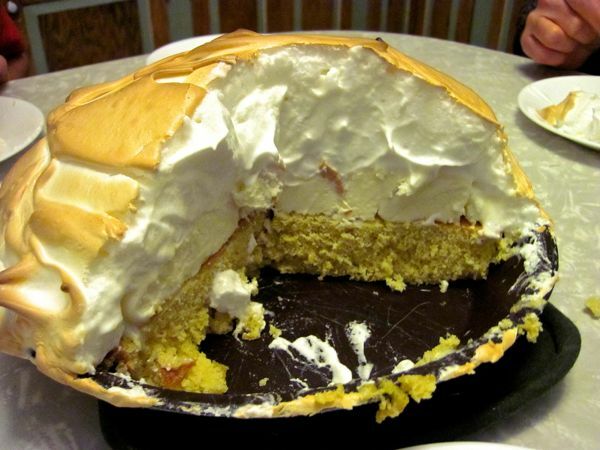 Then as quickly as you can, cover it with a thick coating of meringue. Finally, throw it into the oven to cook the meringue. Voila! The ice cream in the middle remains frozen and the dish that sounds impossible comes out of the oven! 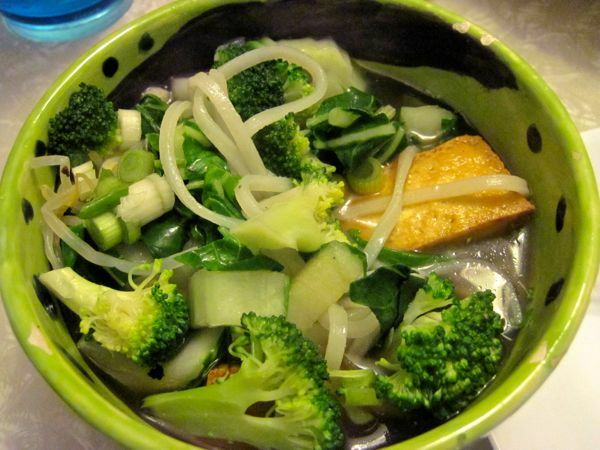 Emma had a hankering for lots of fresh vegetables and hot soup so she made up this Vietnamese Vegetarian Pho. 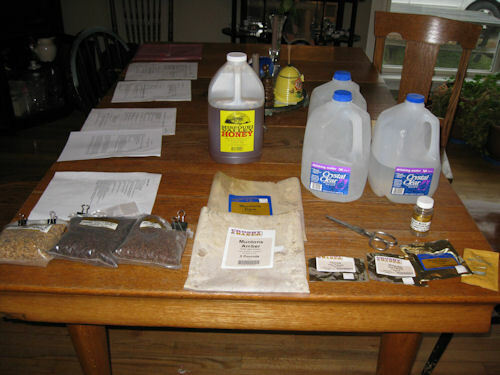 The process to prepare the ingredients was not trivial. What’s invisible in this picture is what it took to make the pot of vegetable broth – all the vegetable that were boiled away and discarded (to the chickens) to make the broth. It was a great mid-winter meal. Didn’t get much above 40 today. Time to throw a roast in the oven. 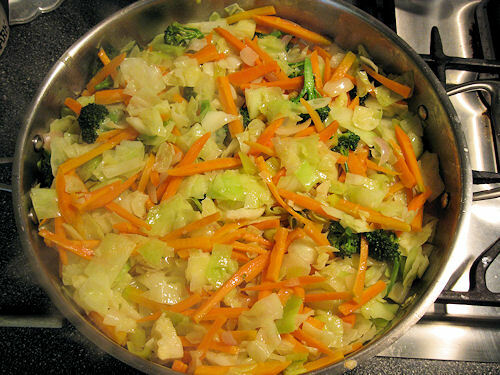 And use up the late fall veggies – cabbage, tomatoes, onions and garlic. With Emma heading off with the Bobcat band to play in Orlando and in the Citrus Bowl parade (corporate sponsor intentionally left off), we couldn’t spend as much time as usual in Minnesota. So we were home Christmas Eve and after sugar-high crash, we were craving something green and fresh. Linda made some spring rolls from scratch for the first time. We’ll work on the rolling, but they were still yummy! 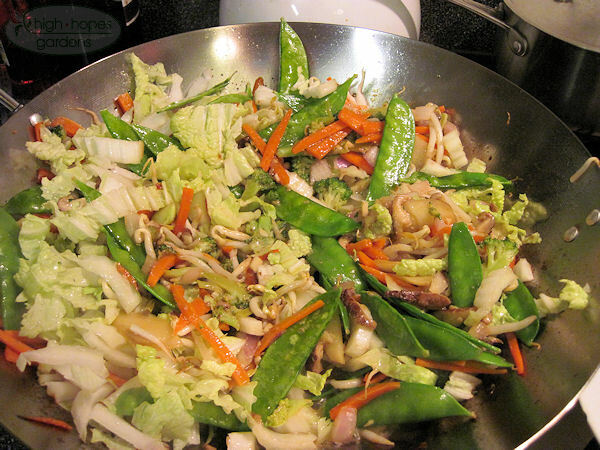 Then it was a wok full of stir-fry for the main course. In the never-ending quest to preserve apples, the third product is now on the shelf. First was canned apple pie filling, then dried apples for snacking, now applesauce. 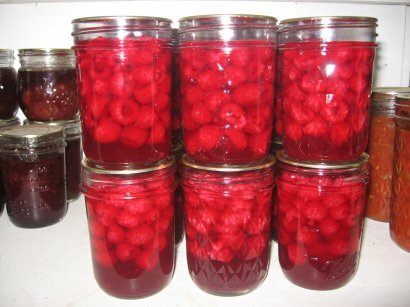 These jars sitting on the storage shelves in the basement have a red color due to the raspberries added to the apples. 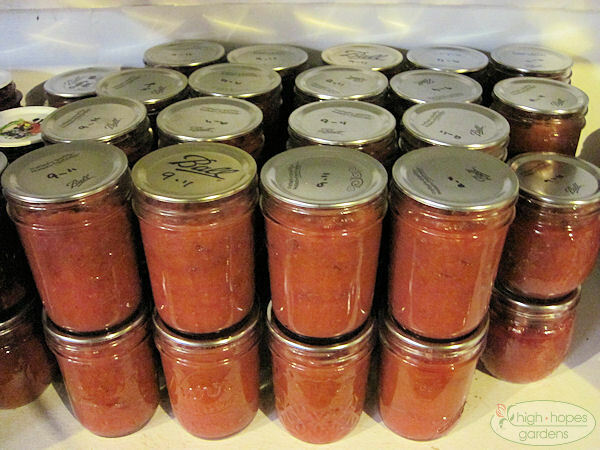 One canning episode was good for about 44 jelly-sized single serve jars for lunches at work. 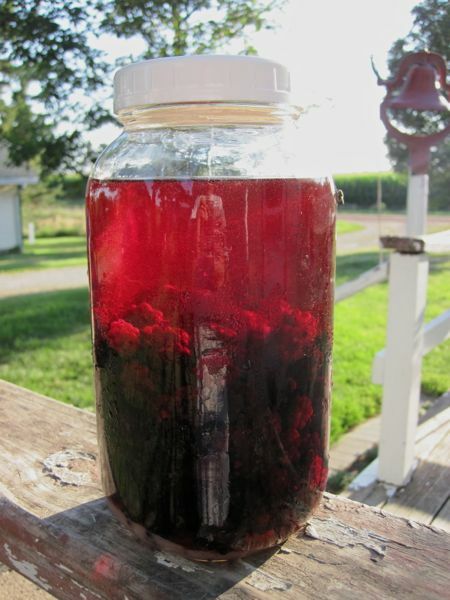 We’ve had no trouble using our raspberries without going to market this year – we traded raspberries for buffalo meat, and handed off 18 lbs of berries to a vinter who promises us bottles of dry wine 6 months from now. 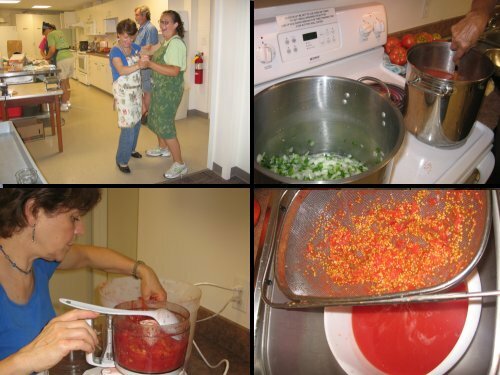 September 3, 2011 – Salsa Time! It’s that time of year. 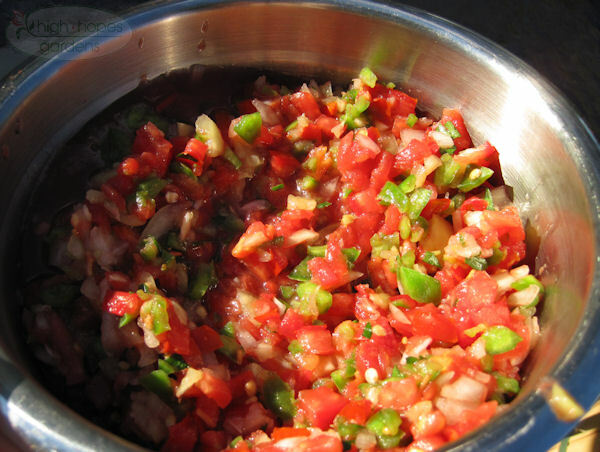 Although we mange to choke down canned salsa over the course of the year, nothing quite sings like fresh salsa. Some of the ingredients assembled, fresh from the garden. The final product -a real late summertime treat. 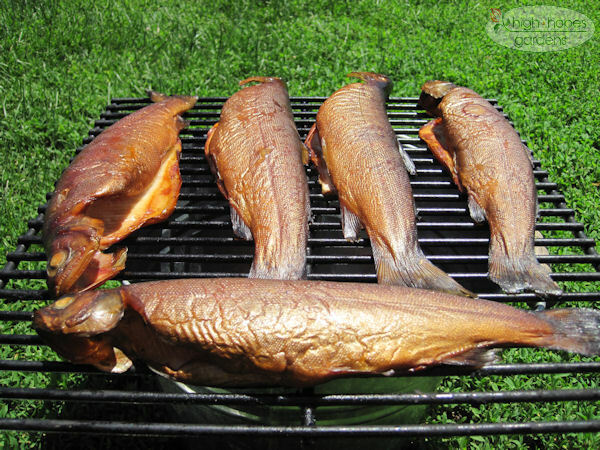 I had the first crack at smoking the trout we recently caught. I thought I’d try half of them, so I grabbed 10 out of the freezer. 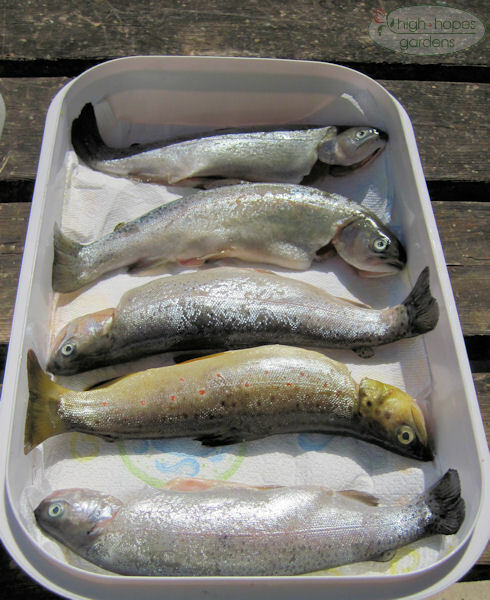 After a bit of brining and wiping dry, the trout are almost ready for the smoker. 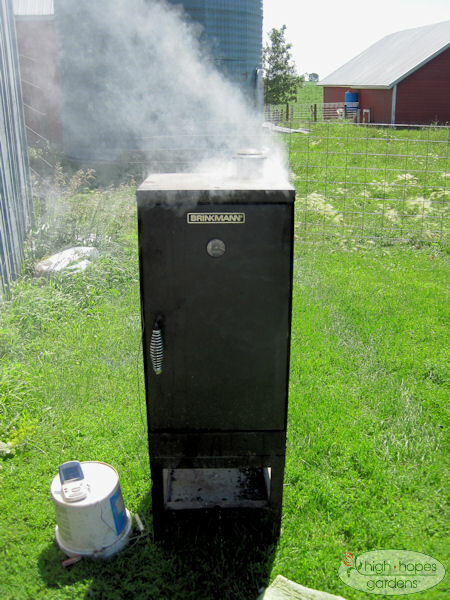 The smoker doing its work. 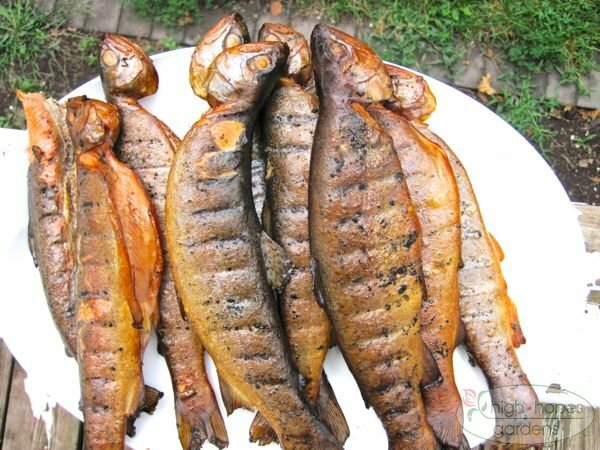 They were very delicious, freezing the trout before smoking did not seem to affect the quality at all. 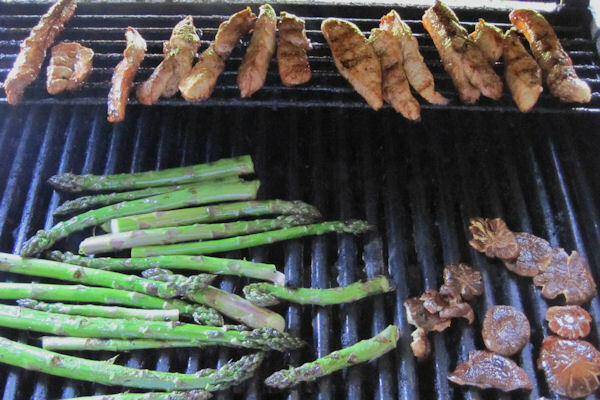 Tonight was another “all farm” grill. The asparagus is finally big enough to cut. 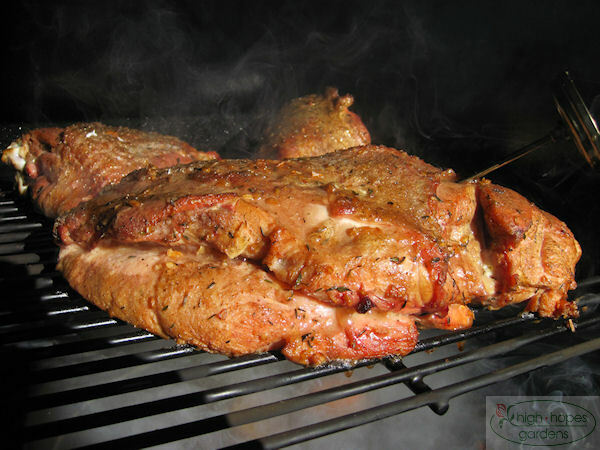 Partnered with some slow-grilled smoked turkey, makes for a happy spring meal!. 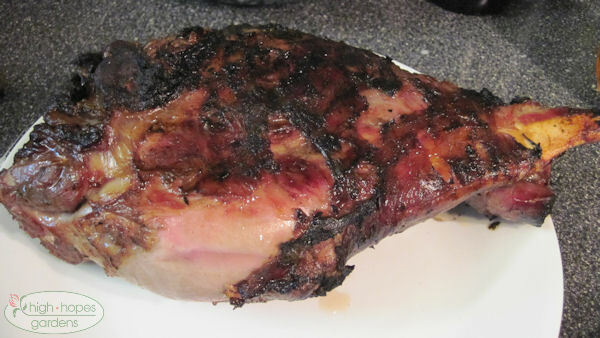 I only managed to take one photo of dinner – a leg of lamb from the smoker. I’ll do this again. 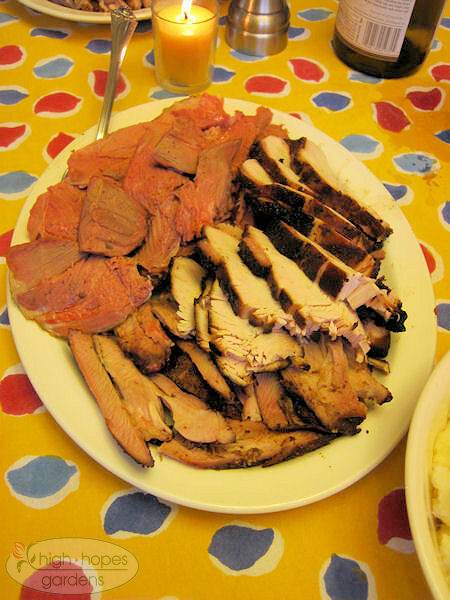 We also had a Niman Ranch ham, the traditional lamb cake and host of others. Also had a houseful with my Mom, sis, her sig other, Claire and two college friends, and cousin Jill from chi-town. The weather continues to be cold and gray. 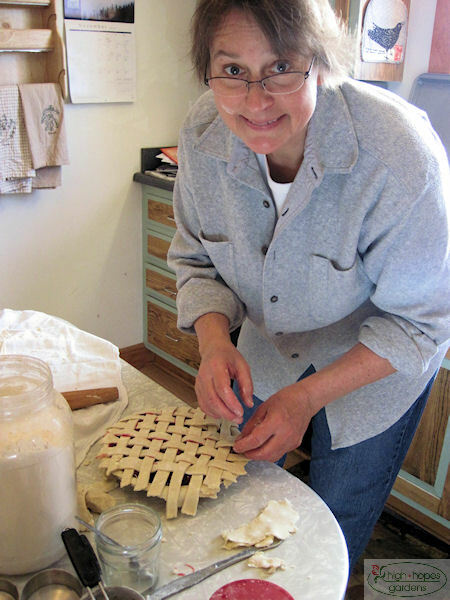 Linda received a sourdough starter a few weeks ago and has been tending it ever since. We’ve been the beneficiaries of sourdough bread, sourdough waffles, sourdough chocolate cake, and a few things I might be forgetting. Martin requests sourdough french toast to be next on the docket. Susan from Squash Blossom Farm alerted me to this video about Total Blueberry and Pomegranate cereal (in honor of my recent post about Dean’s Guacamole Dip that contains less than 2% avocado). This cereal contains not a smidgen of either blueberry or pomegranate, and instead, a few food dyes to stand in place of the advertised fruit. Perhaps the box should read “Total Red 40 and Blue 2 Other Color Added Cereal.” For you fans of Monty Python or the old “Who’s on First” you’ll love this short video explaining the lack of blueberries and pomegranates from Total Blueberry and Pomegranate cereal. 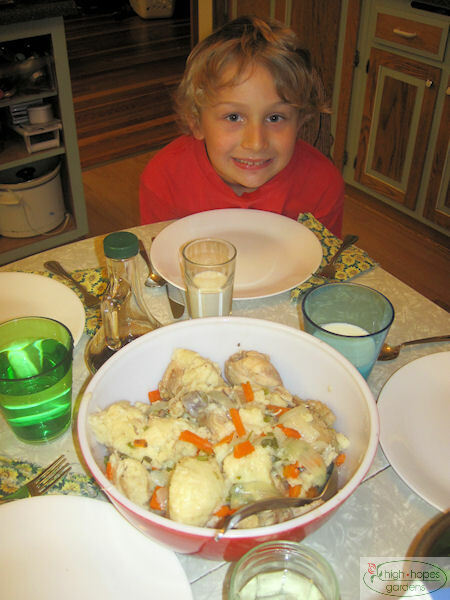 Martin had the afternoon off from school, so he had time for a new cooking adventure. 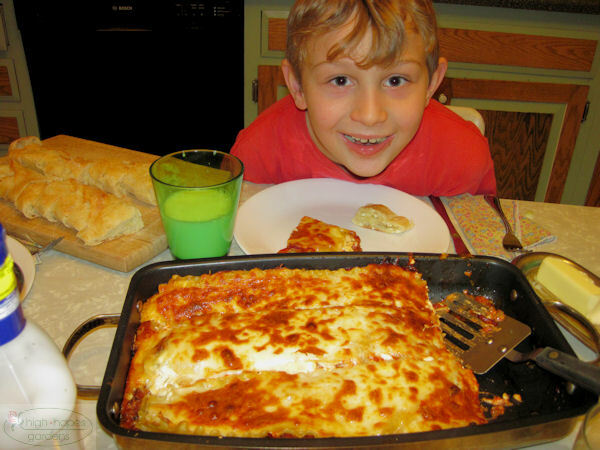 We looked up a lasagna recipe and Martin was off to the races. 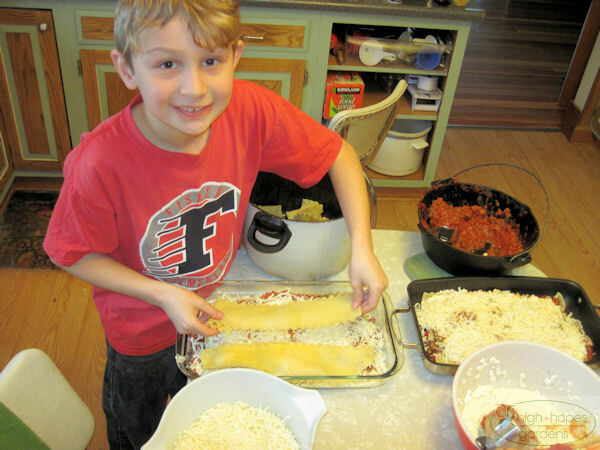 This was Martin’s favorite part, layering the meat mixture, noodles, mozzarella cheese, and cottage cheese mixtures. 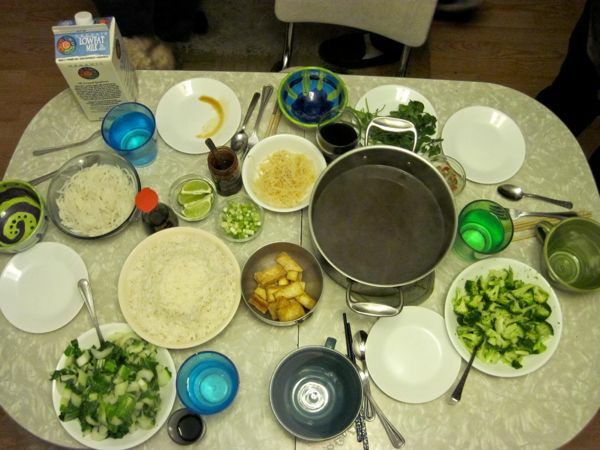 It turned out wonderfully, and best of all, since we were making a big mess, Martin made one to eat and one to freeze. 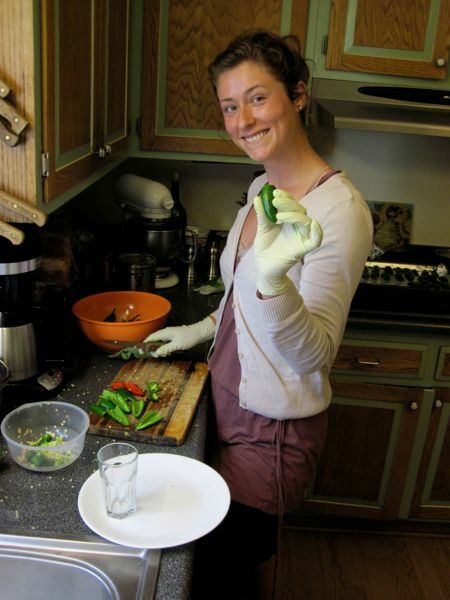 January 4, 2011 – Holy Guacamole! This holiday season we unwittingly had some Dean’s Guacamole dip. Or so we thought we had guacamole dip. The label looks nice – green with photos of avocados, tomatoes, and onion proudly displayed. Better yet, it boasts 0 grams of transfat per serving. But a closer look at the ingredient label reveals that it is only “guacamole flavored” and in fact, contains less than 2% avocado! SKIM MILK, SOYBEAN OIL, TOMATOES, WATER, COCONUT OIL, CONTAINS LESS THAN 2% OF AVOCADO, WHOLE EGG, ONION*, SALT, DISTILLED VINEGAR, EGG YOLKS, SUGAR, NONFAT DRY MILK, WHEY (MILK), LACTIC ACID, SODIUM CASEINATE (MILK), ISOLATED SOY PROTEIN, TOMATO JUICE, VEGETABLE MONO & DIGLYCERIDES, SPICES, SODIUM BENZOATE AND POTASSIUM SORBATE (TO PRESERVE FRESHNESS), GELATIN, CORN STARCH, GUAR GUM, CELLULOSE GEL & CELLULOSE GUM, LEMON JUICE CONCENTRATE, LOCUST BEAN GUM, DISODIUM, PHOSPHATE, GUM ARABIC, XANTHAN GUM, CILANTRO*, NATURAL FLAVORS, EXTRACTIVE OF PAPRIKA, CITRIC ACID, ASCORBIC ACID, BLUE 1, RED 40, YELLOW 5, YELLOW 6. *DEHYDRATED. Should you be able to produce a food label with pictures of ingredients that make up less than 2% of the product? 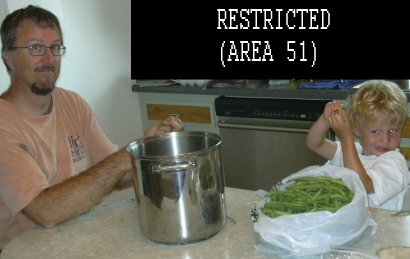 November 12, 2010 – Who Picks Your Fruits and Vegetables and Where do They Sleep at Night? Many state and federal programs are set up to pay for housing for migrant workers. Jessie Lane, Washington Growers League says “It just didn’t make a lot of sense for growers to spend the money to build housing that was just going to sit there for 11 months of the year empty.” Gee, it doesn’t make sense for me to buy a hay baler that sits idle 360 days a year, or a tiller that sits unused 360 days a year. Do you think I can get the government to pay for it, like farm labor housing is being paid for by our tax dollars while the profits stay with the private companies who use the housing? Here are just a few programs I’ve run across the last few months in the Vegetable Growers News magazine. In New York, loan programs are available to help growers pay for housing that provides growers with 10 years of interest-free financing. 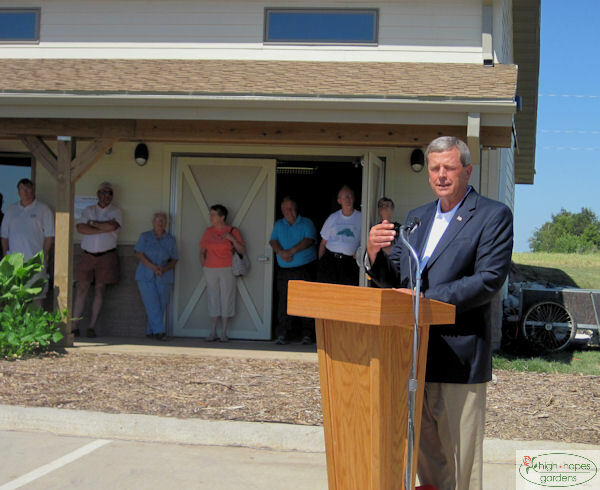 In Michigan – fruit growers have USDA duplexes, which are funded by a loan from USDA’s Rural Development program. There are more than 100,000 agricultural workers in Washington, about one-third of whom are migrant workers, according to the Washington State Employment Security Department. In 1999, recognizing the need for more farm worker housing, Washington dedicated $8 million to creating new housing every two years. 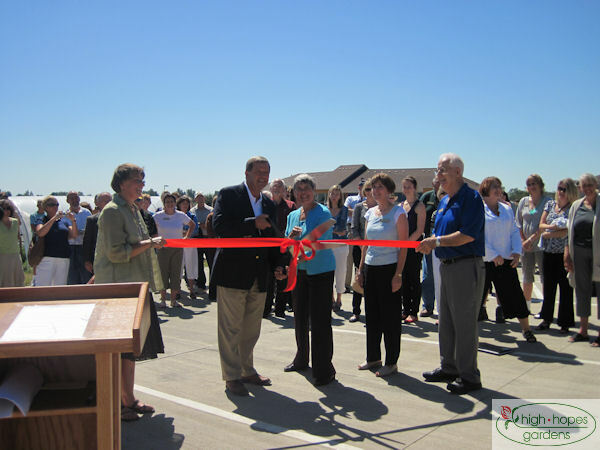 In 2007, the state increased this amount to $14 million every two years and added a $4 million infrastructure loan program for growers who wanted to build on-farm housing. In California, President of the Nisei Farmer’s League says “We’ve recommended to many of our growers: Don’t put housing on your farms,” Cunha said. “You’re asking for trouble.” Cunha envisions a scenario that might solve the state’s migrant housing problems: Let cities take over the construction and management of migrant housing. 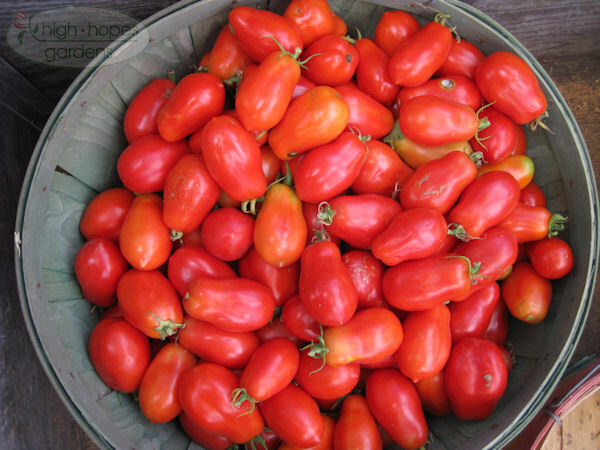 The treatment of these workers can be gleaned from this common-sense advice to growers from Vera Bitsch, an agricultural economics professor at Michigan State University. 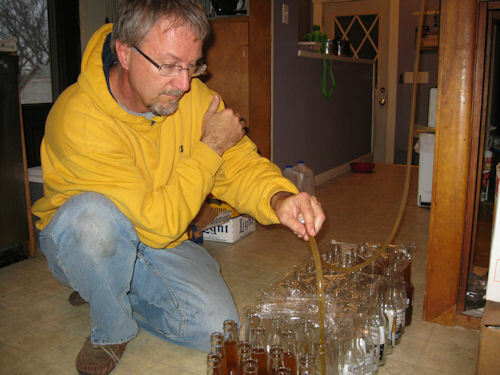 “Simple things like readily accessible drinking water can make a huge difference in worker productivity and morale.” Really, someone has to say this? There’s a reason that no one wants to touch this issue politically. Depending on where you sit, the same person is an “illegal” or “guest worker.” So when politicians rally about closing down the border and stopping the flow of illegals as part of campaign rhetoric, then cash the checks from their big agricultural friends, it’s not surprising that little reform of any kind happens. I would like to point out that I certainly can sympathize with those that want to make a better life for themselves. It points out that there are powerful interests at work that are not being truthful. In the end, it’s all about how important we think food is to us (if you remember Maslow’s Pyramid of needs – shelter and food were at the top of the list, but while shelter is at the top of how we spend our money, food is not.) The following tables highlight the differences from 1901 to 2003. In 1901, shelter accounted for 32.8% of income, in 2002 shelter accounted for 23.3 % of income. 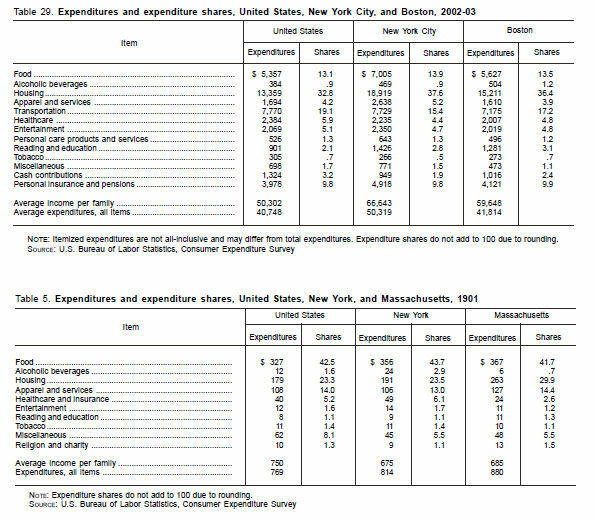 Food, meanwhile required 42.5% in 1901 and only 13.1% in 2003, with approximately 35% of that spent at restaurants. I argue that we should pay the real cost of food at the store, and not in our income taxes. If the real price of food was reflected in the grocery store price, more smaller farmers could compete, increasing rural vitality, and more people would find it worthwhile to grow their own, and be able to take more of their own needs, making them more resilient to economic downturns. 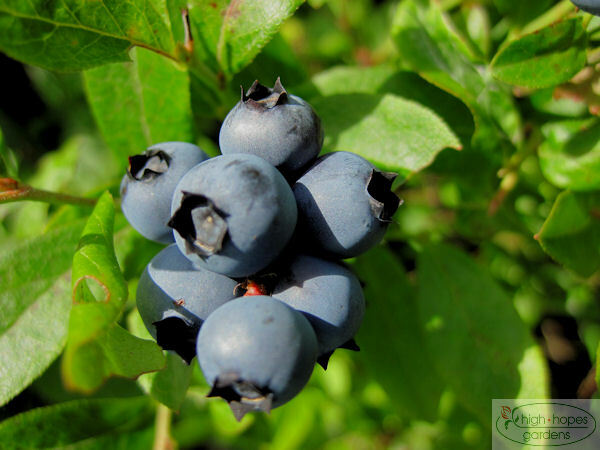 When the berries come on fast, in addition to freezing, we like to can some whole berries – they are great in the winter in yogurt, cold cereal, and pancakes. they are easy to can as well. First heat some water and sugar for the liquid to a boil – add sugar to taste. Heat up canning kettle to boiling. 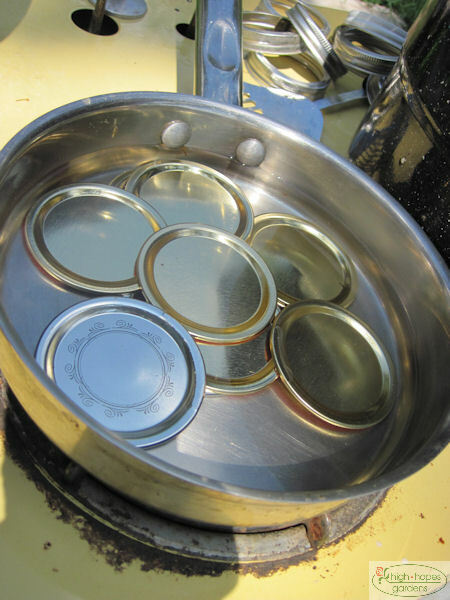 Soften up the canning lids by getting water to nearly boiling and putting lids in and then take off the heat. 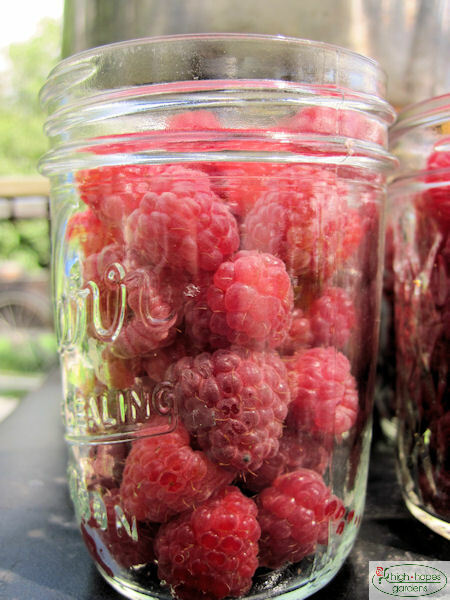 Put berries directly in jars. Fill to within a half inch of the top of the jar with the boiling sugar water mix. 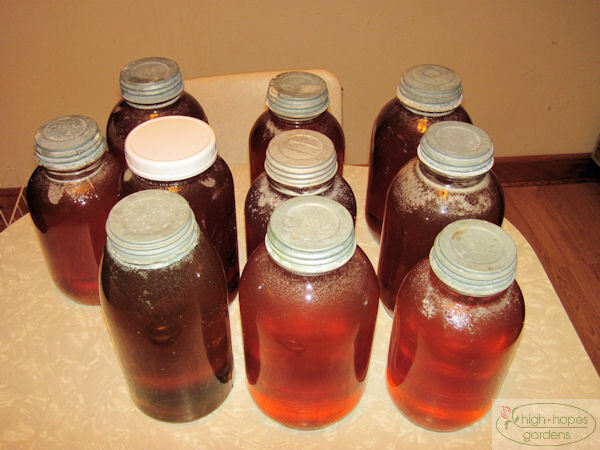 Wipe the rim of the jars dry, put on lids, hand tighten rings, and put in boiling water bath for 20 minutes, making sure an inch of water is above the jars. It’s a quick and easy way to put up food for later. 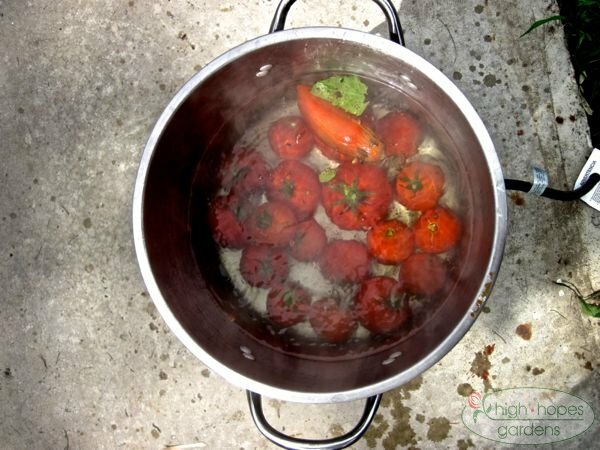 August 6, 2010 – Pesto! My sis and sig other and boy came down this weekend. It’s a great time to visit the farm. With all the fresh veggies, food is fresh. 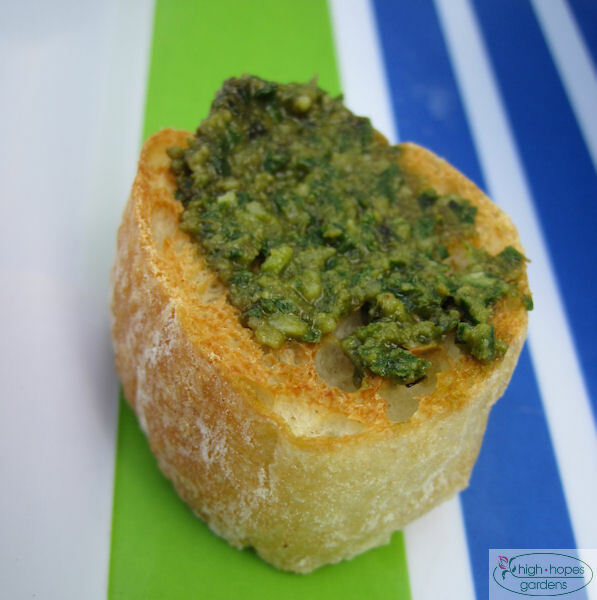 Linda whipped up some pesto and the picture pretty much speaks for itself! We have (finally) produced a cheese that makes excellent use of our goat milk. Here’s the culture as it looks after sitting for about 24 hours. The liquid is whey and the curd is the more solid, cheesy looking stuff. We fed the whey to the chickens. 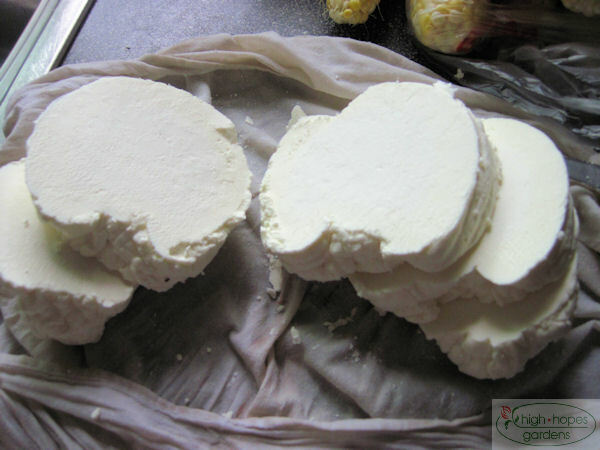 This is what it looks like after the curd was allowed to hang in the fridge for a couple of days. This makes the cheese more firm as the last of whey drips out. We found this to be delicious on crackers. Some we mixed with garlic and chives, another with dill, and a third we made with salt and pepper. These can be frozen too. Ya’ll saw the cherries a few days ago. 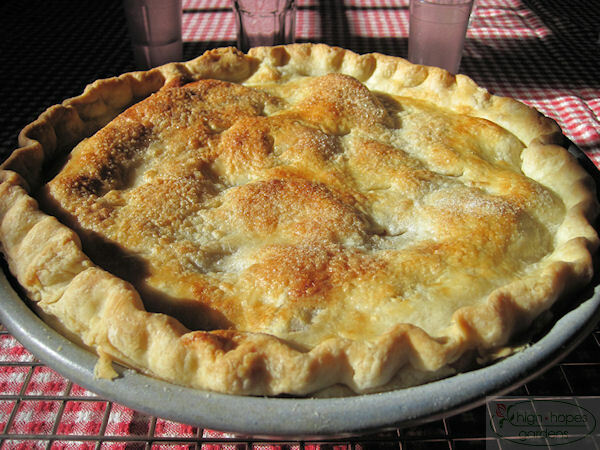 Here is one of the finished products from blue-ribbon pie baker Linda. 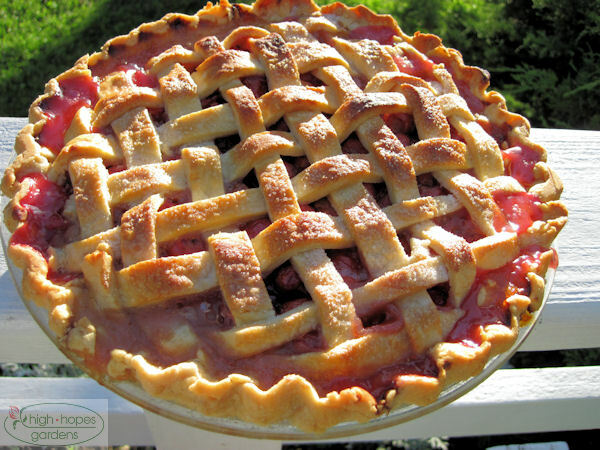 She’s trying to pass pie-making down to children, but nobody quite has the knack yet. I think Martin may end up with the best chance to master it. Claire has been posting various Indian sweets on her blog, so I thought we’d fight back with the heavy artillery! 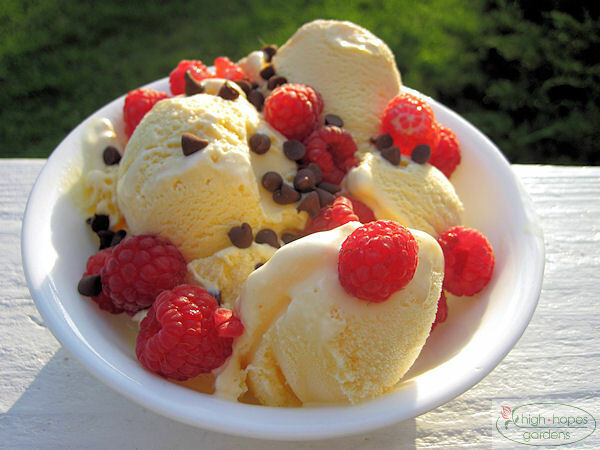 June 23, 2010 – Summer Treat! Getting hungry now, I must admit! Rain continues, now it’s rained 20 of the last 23 days – today at about 3 am, 6 am, and one last drizzle at 10 pm before clearing. 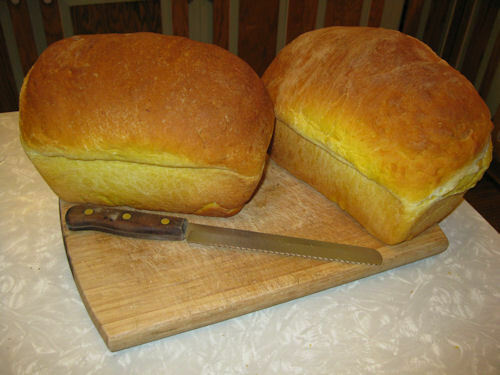 It’s hard to go wrong with homemade bread, especially if someone else is willing to make it for you! This is Cuban Bread, an easy cousin to French Bread. Linda provides the recipe following the photo. I used my kitchen-aid mixer to mix and knead the dough. 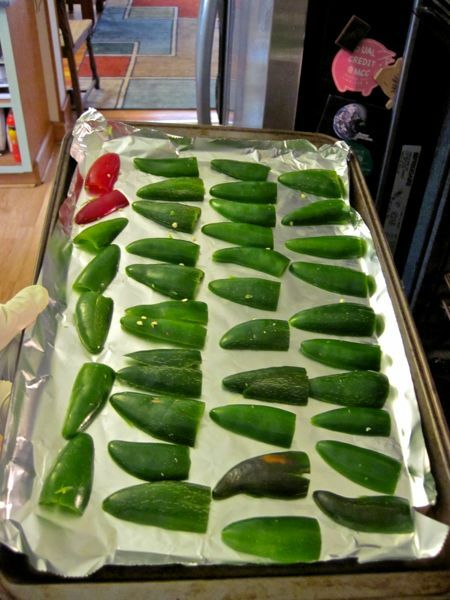 Prepare a baking sheet by greasing it or with corn meal or parchment paper. I liked the texture of the corn meal. 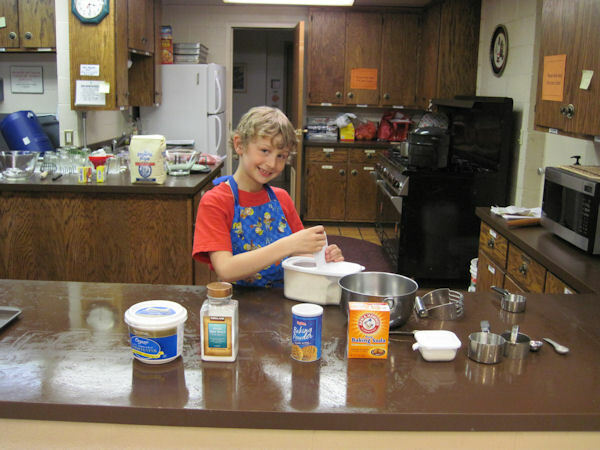 Place 4 cups of flour in a large mixing bowl add yeast, salt, and sugar. Stir until blended. Pour in hot water and beat for 3 minutes with the mixer flat beater. Gradually work in the remaining flour 1/2 C at a time. I used a scant 5 cups. 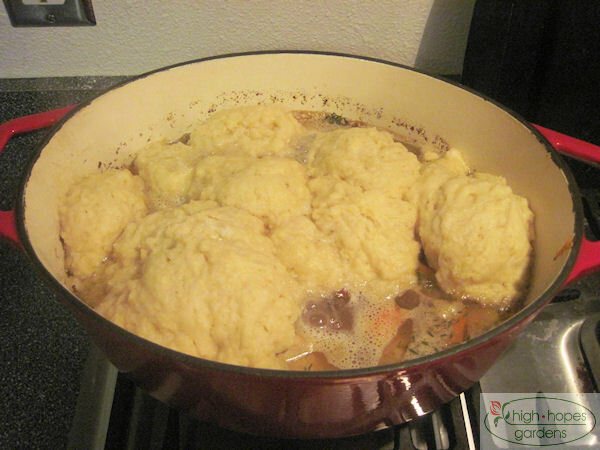 Mix until the dough takes shape and is no longer sticky. Knead using the mixer for 45 seconds (or 8 minutes by hand). 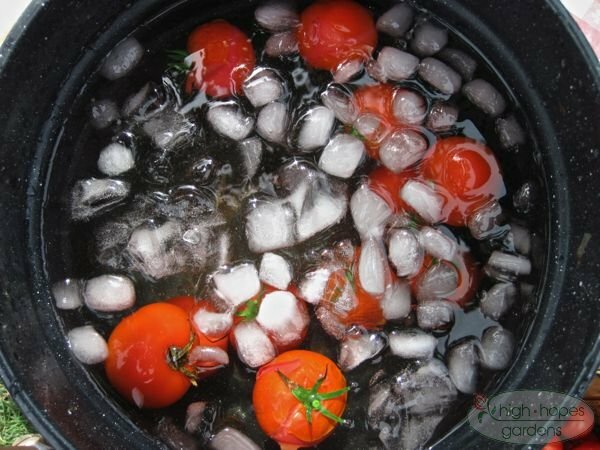 Place dough in a greased bowl, cover with plastic wrap and allow to rise in a warm place for 15 minutes or until the dough doubles in size. 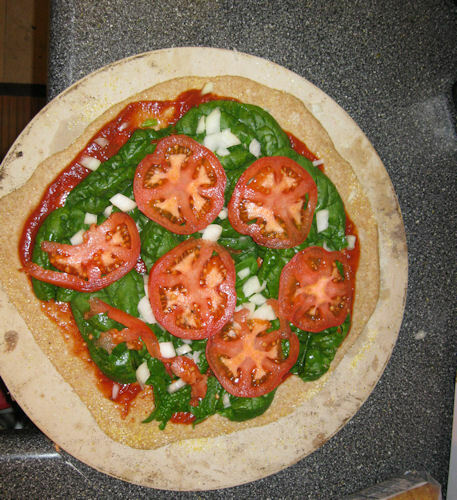 Punch down the dough, turn it out on the work surface, and cut into 2 pieces. Shape each into a round. Place on the baking sheet. 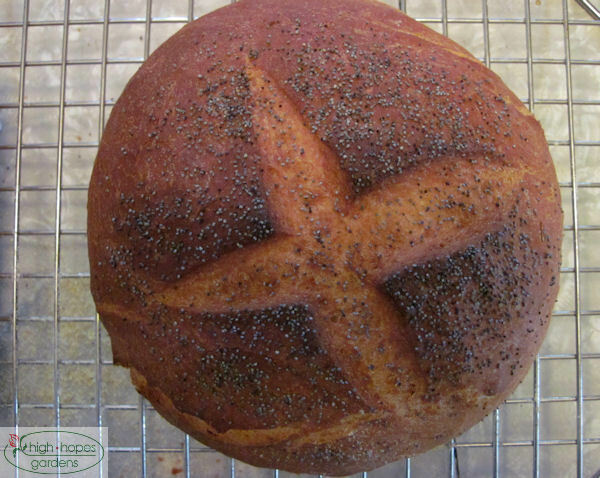 With a sharp knife, slash an X on each of the loaves, brush with water, and if desired, sprinkle with sesame or poppy seeds. 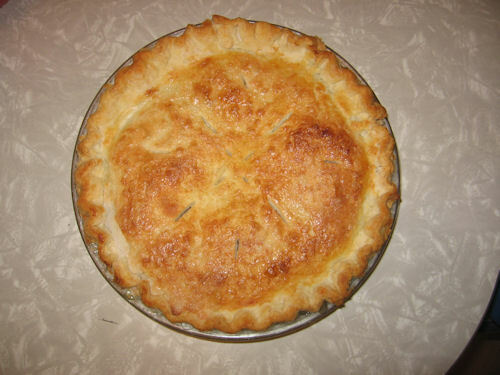 Bake at 400 degrees (350 degrees in convection oven) for 45-50 minutes. Place the baking sheet on the middle shelf of a cold oven. 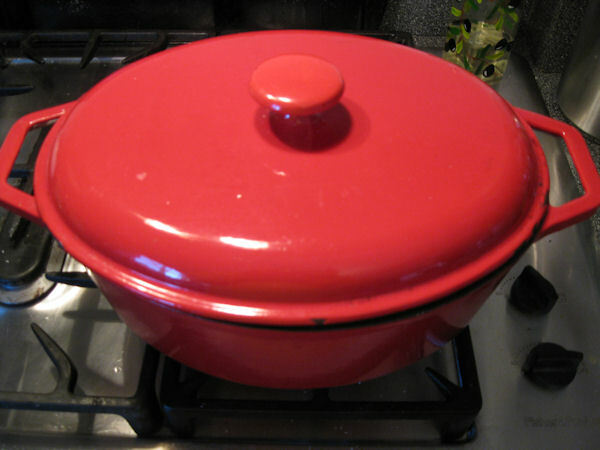 Place a large pan of hot water on the shelf below, and heat the oven to 400 degrees. The bread will continue to rise while the oven is heating. Bake for about 50 minutes, or until the loaves are deep golden brown. Thump on the bottom crusts to test for doneness. If they sound hard and hollow, they are baked. Note: Since the bread does not have shortening, it will not keep beyond a day or so. Even though it may begin to stale, it makes excellent toast for many days and freezes well. 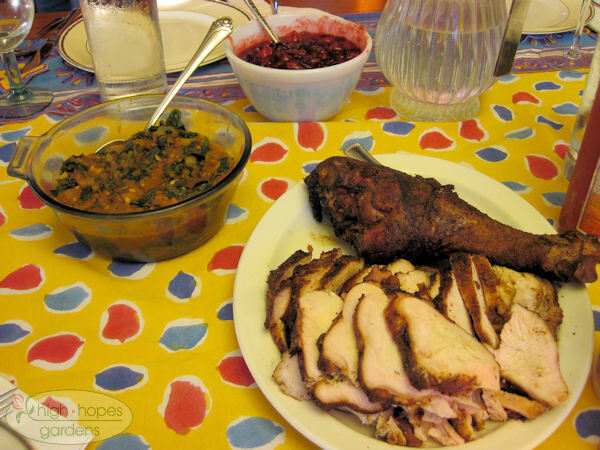 May 2, 2010 – Local Meals! This weekend we attended our church’s regional conference in Davenport. The conference put an emphasis on involving all ages, so we proposed a session from the kitchen on “cooking local” thinking it would be a nice change from conference center meeting rooms. Here Martin is helping us to prepare – we made biscuits form scratch using local flours, and in the background you can see that we also set up to make jam – both raspberry and strawberry with frozen berries from the farm. About 20 people signed up and all seemed to enjoy sampling the jam on the hot biscuits and bringing a jar or two of jam home as well. It’s that time of year – winter drags on, colds appear. 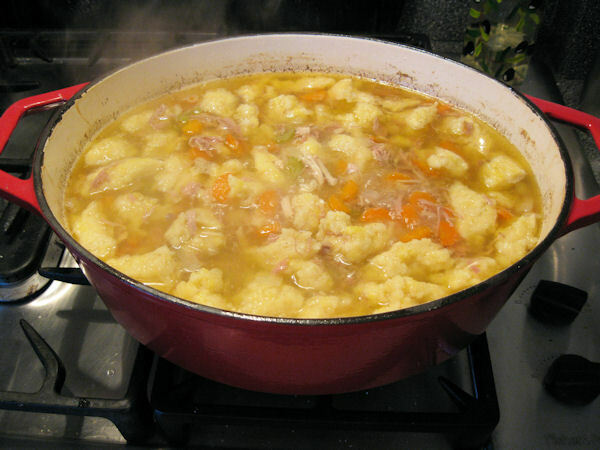 Vat ‘o chicken soup with dumplings! Good for whatever ails you! 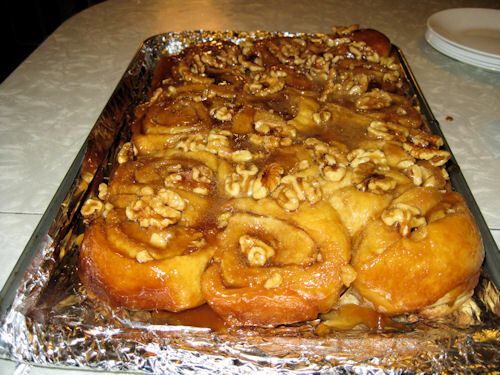 One of the treats during the break is that we get a pan of home-made sticky cinnamon rolls that appear about twice a year. OK. This is probably the last thing out of the garden this year – kale. 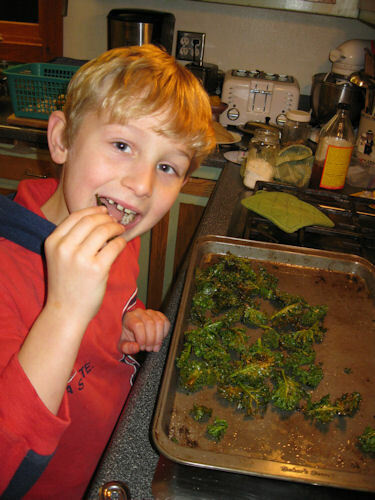 Here Martin samples the crispy kale. Just de-vein the kale if desired, sprinkle with a bit of olive oil and apple cider vinegar and bake for a few minutes, turn and bake again until crispy – a great alternative to potato chips! 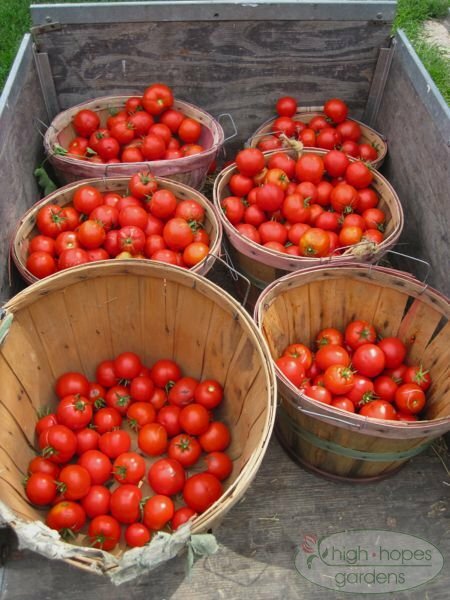 Once again, it is time to offer the bounty of the farm for holiday gift-giving. 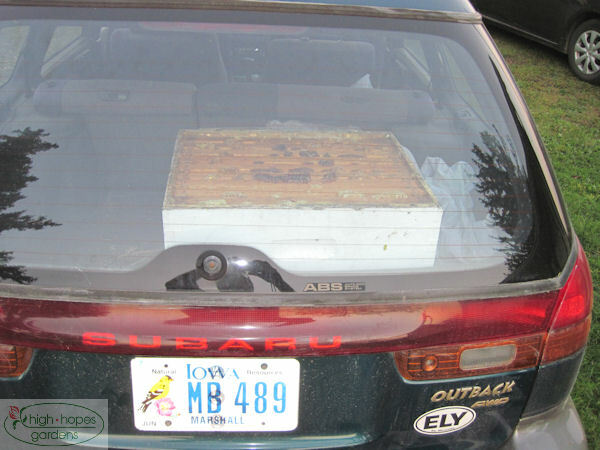 Many customers love the local, made in Iowa, non dust-collecting nature of the boxes. 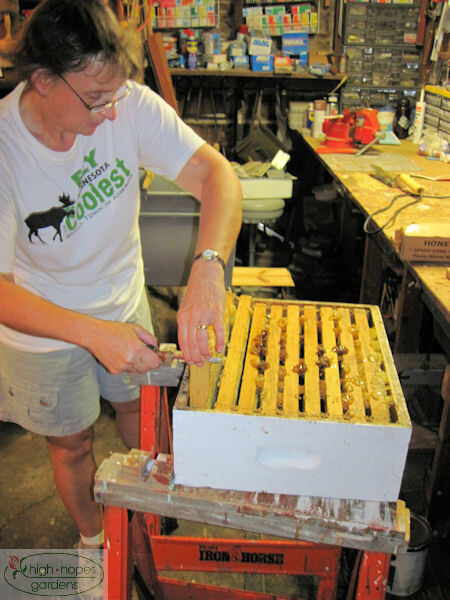 The boxes contain various combinations of jams made from organically raised fruit from the farm, honey from the farm, real goat milk soap made on the farm from scratch (not the harsher glycerine type), and beeswax candles made with wax from other central Iowa beekeepers (our bees don’t produce enough for all our candles). 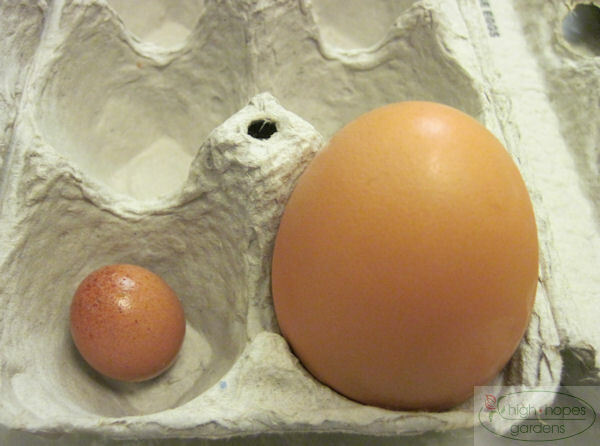 The large gift box contains two 4 oz. jam samplers, one 4 oz. 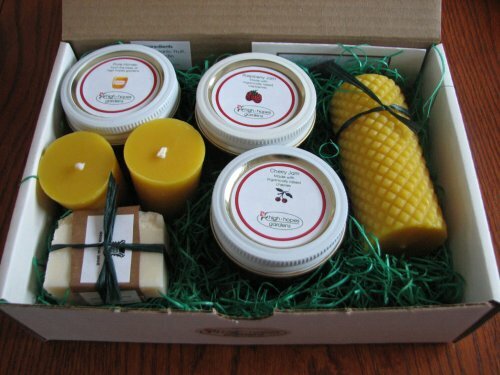 honey sampler, two beeswax votives, a four inch beeswax pillar, and a half bar goat milk sampler soap bar along with a gift card offered for $25.00. The medium gift box contains two 4 oz. 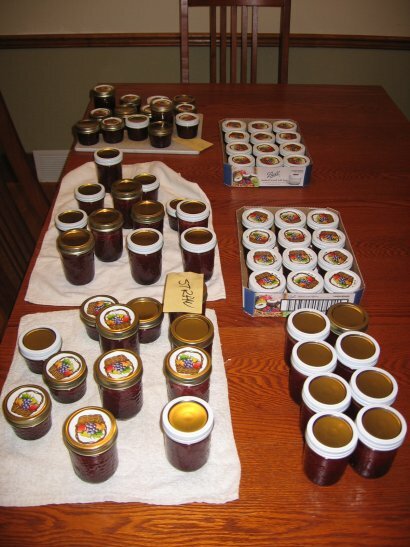 jam samplers (or one jam and one 4 oz. 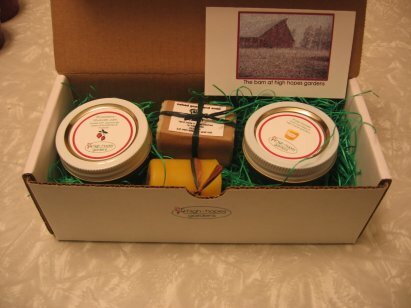 honey sampler), a beeswax votive, and a half bar goat milk sampler soap bar along with a gift card offered for $15. 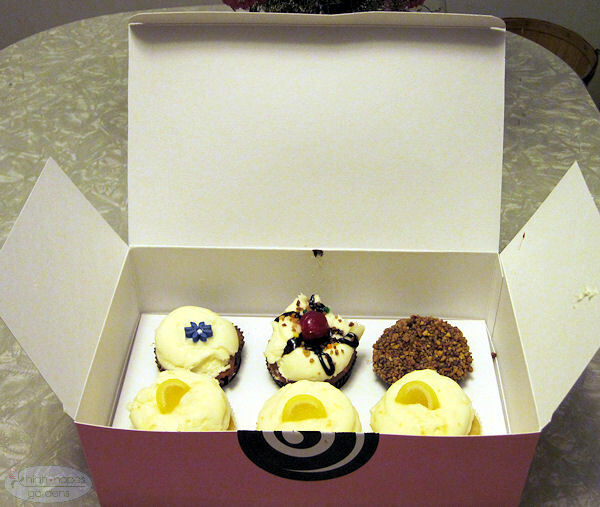 The small gift box contains two 4 oz. 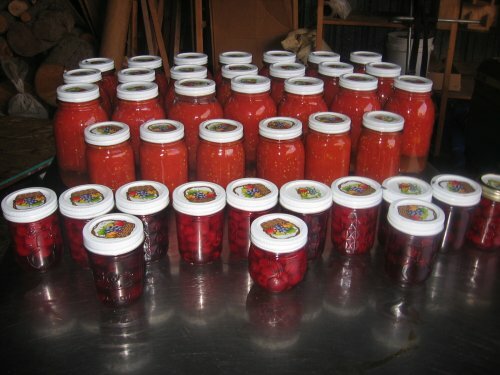 jam samplers, one 4 oz. 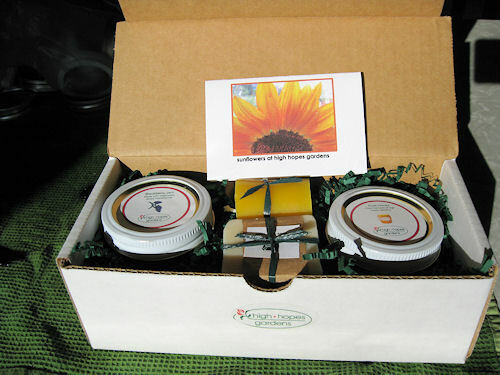 honey sampler, along with a gift card offered for $10. 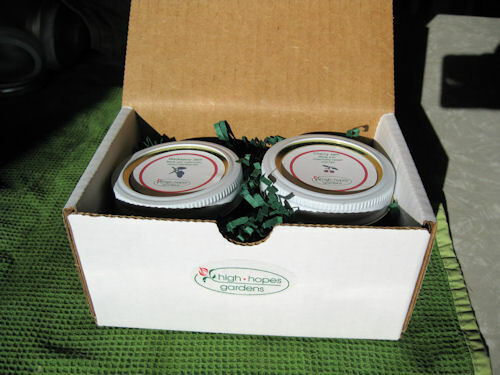 The mini gift box contains two 4 oz. 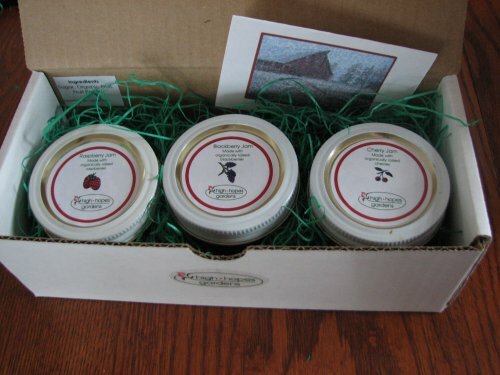 jam samplers along with a gift card offered for $7.50. 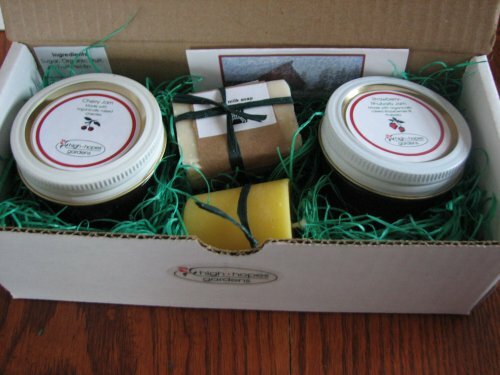 In all gift boxes, choice of jams and honey are interchangeable. 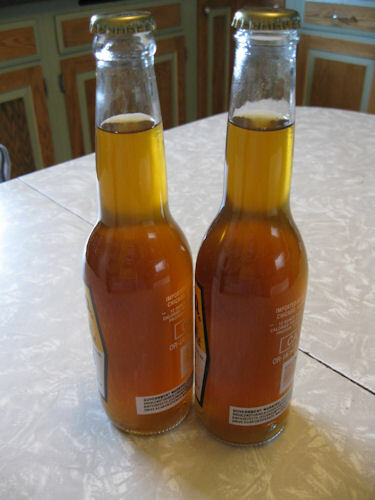 In addition, 4 oz. 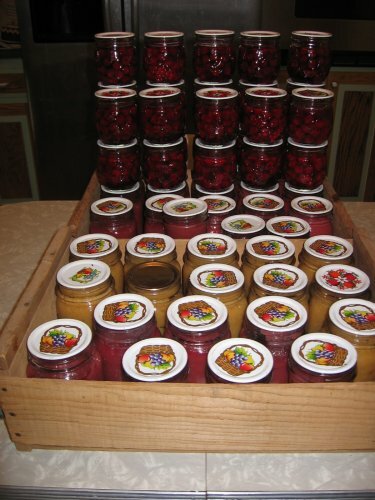 jams are available for $2.50 each. 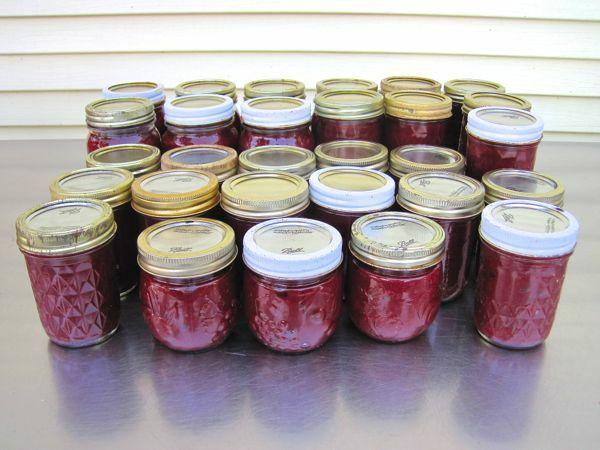 Specific jam requests are available first-come, first serve – this year we have red raspberry, golden raspberry, blackberry, strawberry, strawberry rhubarb, cherry and plum. We offer delivery to our workplaces or church, pick-up at the farm, or shipping to your destination with a shipping quote upon getting a shipping zip code. Remember it was a bumper year for squash? 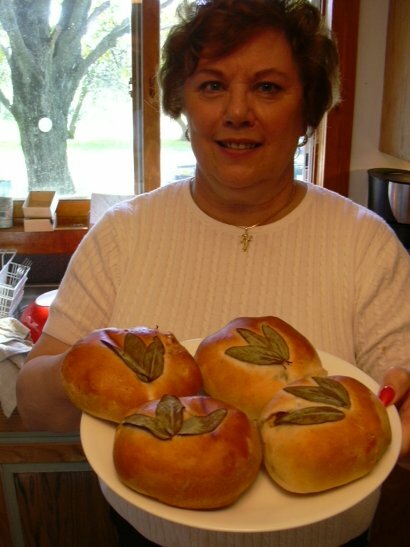 Linda ran across a bread recipe that makes a beautiful moist yeast bread with an orange tint. 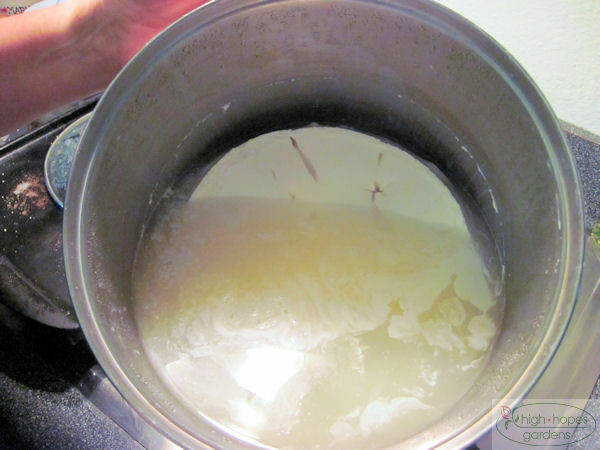 In a very large bowl, dissolve yeast in warm water. Add sugar; let stand for 5 minutes. Add the squash, milk, brown sugar, butter, eggs and salt; mix well. Add 6 cups flour. Beat on medium speed for 3 minutes. Stir in enough of the remaining flour to form a soft dough. 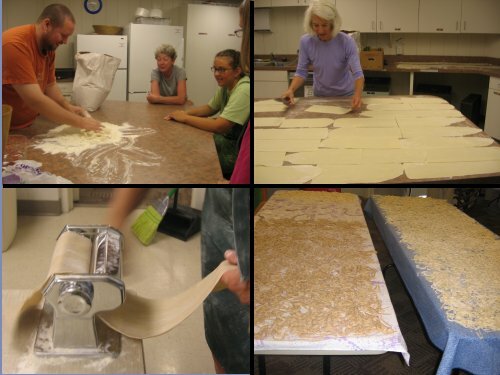 Turn onto a floured surface; knead until smooth and elastic, about 10 minutes. 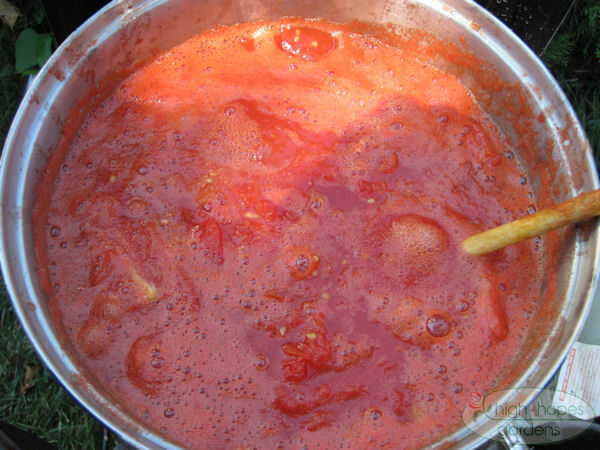 Place in a greased bowl, turning once to grease top. Cover and let rise in a warm place until doubled, about 1 1/4 hours. Punch dough down. 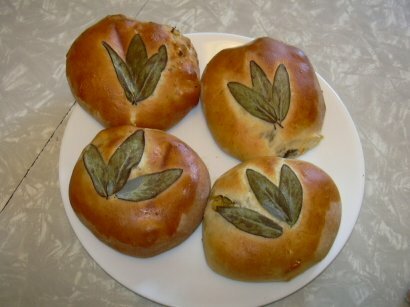 Divide into three portions; shape into loaves. Place in three greased 9 x 5 inch loaf pans. Cover and let rise until doubled, about 45 minutes. Bake at 350 degrees for 35-40 minutes or until golden brown. Cool for 10 minutes before removing from pans to wire racks to cool. Today we attended a fundraiser for the Practical Farmers of Iowa. Appetizers for the meal included a variety of roasted garlic varieties. 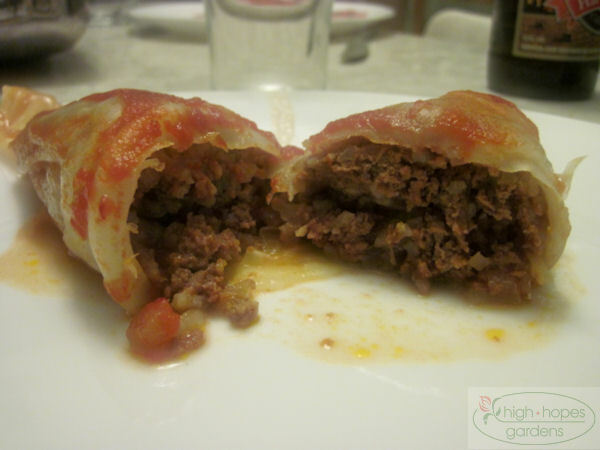 I was surprised at the vastly different tastes of the garlics. The rest of the meal was ably prepared by chef Donna Prizgintas, who among other things, was Paul Newman’s personal chef. The dinner included a beet gelee on a bed of microgreens, a main course of roasted white carrots and red peppers, along with two kinds of chicken. The meal was topped off with a squash crumble. Earlier in the afternoon, there was a stop at Northern Prairie Chevre goat cheese farm. 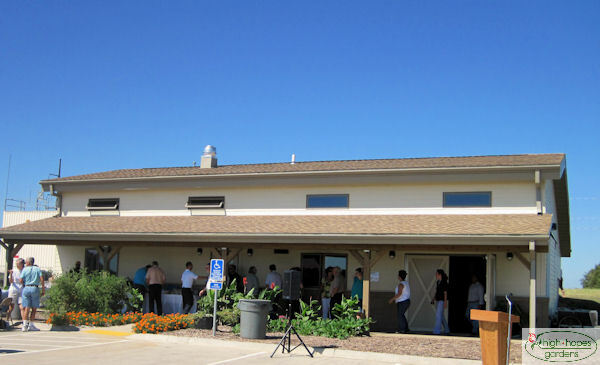 Next was a stop at Snus Hill winery, where the meal was served. 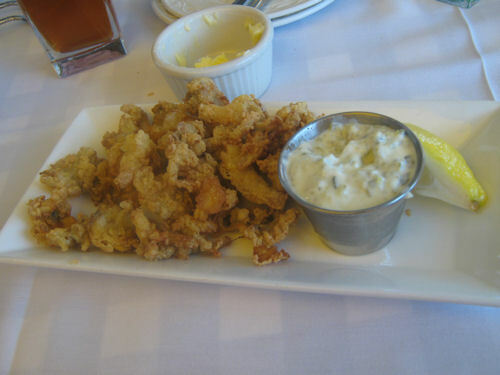 It’s hard to say what was better – the conversation and company or food! Part of tagging along with Claire meant I could participate in the symposium sessions. One of the speakers was Bill Gates, a guy who used to work for Microsoft. I was rather disappointed with the Register’s coverage of his speech as the headline read “Gates calls Biotech Seeds Critical to Fighting Hunger.” Although there is no doubt of that as he said “I made a fortune in technology, so it should be no surprise I’m a fan of agricultural technology.”Â However, I took his real message as the he said the ONLY way to “solve” world hunger would be a improve the standing of smallholder farmers and working with their governments and local institutions. 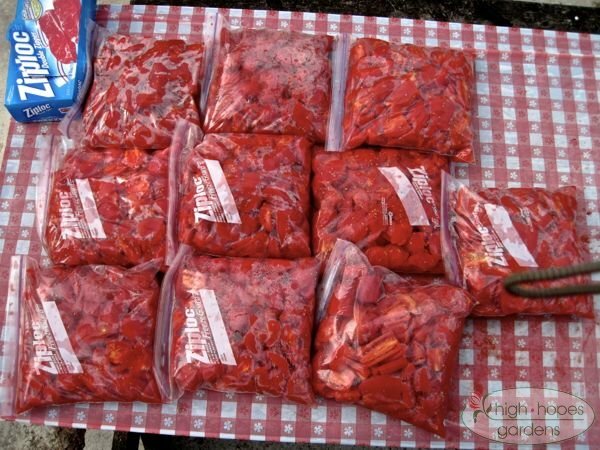 I don’t see how distributing GMO seeds to every remote corner of the world will be feasible, especially on an annual basis as the seeds cannot be saved from one year to the next. The logistics of that are staggering. 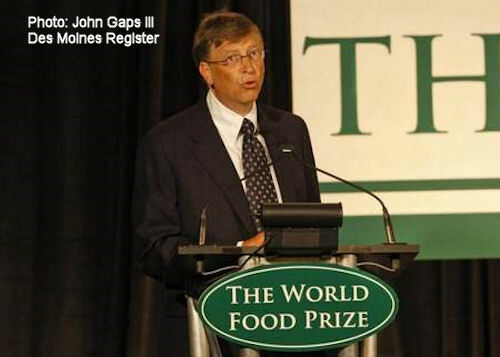 Gates also pointed out that it also is important to avoid the environmental degradation linked with the Green Revolution in the 1960s, when increased use of fertilizer and pesticides helped boost crop production in Asia. Of the 1.2 billion the Gates foundation money, about 5% is targeted to biotech. All in all, I thought the headline was an easy out to focus on the most controversial part of his speech. After all it’s much easier to write that than delve into the relatively boring details of working on world hunger. 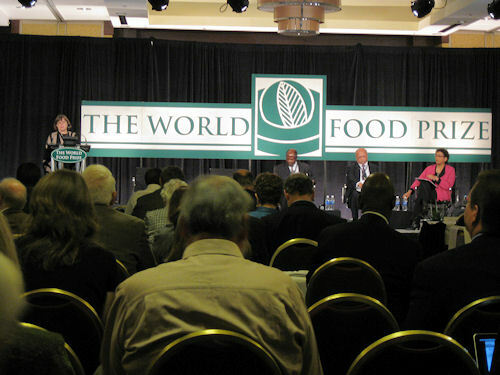 Perhaps a session that was more interesting was this one hosted by former food prize laureate Catherine Bertini. The topic was one that sounded academic and dry, but turned out to be fascinating – “Gender in Agriculture, Nutrition and Health. The take-home from this panel was that, when we think of worldwide farmers – think of a face of a woman, as 80% of the farmers in the world are women. 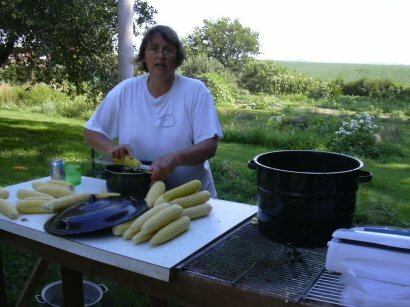 Typically women gather the food, prepare the food, and grow the food. Studies have shown that women are also better stewards of the money for the household – using it more wisely to take care of children than men. But women, around the world are much less educated, and previous aid programs did not consider the fact of who is dong the farming. Foods would be sent to fuel-poor countries that took too long to cook – bags of seeds were sent in 50 lb bags, to heavy for women to handle. Education and extension is delivered to men. Educated women have fewer children, and thus an easier economic time. Perhaps one of the best success stories was that relayed by the director of the Bangladesh Rural Advancement Committee. Over the past 20 years, no country has lifted more people out of hunger than Bangladesh, primarily through BRAC. This organization is certainly a model for other efforts – I urge you to take a look and also take a look at one of the student interns from the World Food Prize and her paper reflecting on her experience working with BRAC. It is enlightening, heartbreaking, and inspirational. I found the symposium to present many points of view – including a panel that had the “Sustainability Director” of Syngneta, the Chief Economist from John Deere, a researcher from the Worldwatch Institute and a former Food Prize Laureate and current leader of the Millenium Institute! Perhaps the most surprising session was one that dealt with global climate change and agriculture. Unexpectedly, the strongest urge to action to stop human-induced climate change came from a 3 star Navy Admiral. He and other highest-ranking recently retired members of the U.S. Military called climate change the biggest threat to national security the United States faces. After carefully considering the threat of climate change and America’s current energy consumption to our national security, theÂ Military Advisory Board finds the trends and warnings are clear. Our sobering conclusion is that climate change and the U.S. energy posture constitute a serious and urgent threat to national security â€” militarily, diplomatically and economically. Climate change differs from traditional military threats. It is not a well-defined enemy or a specific crisis spot with a fixed timeline for response. Rather, it is a threat multiplier that magnifies instability in the most volatile places in the world and increases a variety of threats across the board. This will inevitably create a growing need for U.S. military intervention with missions ranging from humanitarian assistance, to peacekeeping, to the need to deal with dangerous conflicts over resources in regions critical to U.S. national security. The conditions created by climate change will vary across the globe and affect different locations, including in our own nation, in a variety of ways: drought, flood, extreme weather events, crop failure, acidic oceans, fishery collapse, starvation and disease. These conditions will lead to conflict over scarce resources and cause mass migration by people in search of security and the essentials of life, creating sustained natural and humanitarian disasters on a scale and at a frequency far beyond those we see today. This, in turn, will create great social and political instability where demands for basic human needs exceed the capacity of governments to cope. As fragile states become failed states, desperation, hopelessness and a vacuum of governing power create a dangerous breeding ground for extremists and terrorism. When populations get more desperate, the likelihood of military conflicts goes up, and the more instability, the more likely and greater the pressure to use our military. Climate-driven crises are already happening. Darfur and Somalia are present-day examples of instability and failing states. In South Asia and in the Middle East, very densely populated regions with long-standing tensions, climate change will create greatly increased competition, and perhaps regional conflict, over traditional supplies of fresh water. As the Himalayan glaciers recede, nations such as China, India and Pakistan will have to deal with internal and external unrest due to a much less reliable source of water to meet the needs of growing populations. There already exists a rapidly increasing competition for diminishing supplies of water for agriculture and basic human needs in the Middle East. At the same time, increasing demand for, and dwindling supplies of fossil fuels will lead to greater instability around the world, including many of the places worst hit by climate change. In our second report, the CNA Military Advisory Board concluded that America’s approach to energy has placed the nation in a dangerous and untenable position. The report identifies a series of current risks created by America’s energy policies and practices. Militarily, our inefficient use and overreliance on oil adds significantly to the great risks already assumed by our troops. It reduces combat effectiveness and exacts a huge price tag in dollars and lives. It puts our troops â€” more directly and more often â€” in harm’s way. Fuel convoys can stretch over great distances, traversing hotly contested territory and become attractive targets for enemy forces. Ensuring convoy safety and fuel delivery requires a tremendous diversion of combat force. As in-theater energy demand increases, more assets must be diverted to protect fuel convoys rather than to directly engage enemy combatants. We saw this in Iraq and we are certainly seeing it in Afghanistan where the pace of military operations, the size of the force and its effectiveness is literally paced by our ability to get fuel when and where it’s needed. Consider the recent hijacking of fuel trucks by the Taliban in Afghanistan and the ensuing civilian deaths, greatly damaging the political goals that are central to the NATO and coalition mission. The commandant of the Marine Corps recently deployed an energy audit team to Afghanistan to find ways to increase energy efficiency and to use more sustainable forms of energy in order to lighten the expeditionary load, lower logistics vulnerability and improve fighting effectiveness. Beyond the military’s own fuel needs, our nation consumes more oil than any other single country. Ensuring the flow of that oil stretches our military thin â€” the men and women already fighting wars on two fronts. We rely on our armed forces to protect sea lanes and maintain a continuous high level of forward presence to ensure we can fill up our cars and trucks. The October 2000 terrorist attack on the USS Cole, while on a refueling stop in Yemen, was a tragic reminder of the convergence of oil, instability, terrorism and the need for ever vigilant forward presence by Americans in uniform. And our nation’s dependence on oil â€” not just foreign oil â€” reduces our leverage internationally and limits our diplomatic options. We simply do not have enough oil resources in this country to ever meet our growing demand or to shield us from the volatile price spikes and shortages in a global market. Even accounting for the recent discovery of deep sea oil reserves in the Gulf of Mexico, America controls only 3 percent of the world’s oil supply while we consume 25 percent of the oil produced every year. Making the assumption that fuel is going to be available and affordable whenever and wherever we need it leads to a fundamentally flawed strategy. It will neither be available nor affordable. The growing divergence of supply and demand curves for global oil dictates ever-greater scarcity and ever increasing cost. By remaining dependent on oil the United States will continue to be entangled with unfriendly rulers and undemocratic nations â€” simply because we need their oil. And we cannot produce enough domestic oil to change this dynamic. That is just a short-term solution that simply continues our harmful addiction to oil. We need to recognize that we cannot drill our way to sustained prosperity and security â€” we have to wean ourselves from our reliance on oil, starting now. Economically, we are in the midst of a severe financial crisis, and our approach to energy is a key part of the problem. We are heavily dependent on a global petroleum market that is highly volatile. In 2008, we sent $386 billion overseas to pay for oil â€” a good deal of it going to nations that wish us harm. In the last year alone, the per-barrel price of oil climbed as high as $140 and dropped as low as $40. Just a $10 change in the per-barrel cost of oil translates to a $2 billion increase in the Pentagon’s energy costs. This price volatility is not limited to oil â€” natural gas and coal prices also saw huge spikes in the last year. While coal and natural gas resources may be plentiful, they are increasingly difficult to access, and have associated impacts that are expensive. As we begin to recover from the current global recession, the price of energy will inexorably go up and with it, the risks to our nation’s economic and security future. There are those who say we cannot afford to deal with our energy issues right now. But if we don’t begin to address our long-term energy profile now, future economic crises will dwarf this one. The market for fossil fuels will be shaped by finite supplies and increasing worldwide demand, the volatile cycle of fuel prices will become sharper and shorter, and without immediate action to change our energy profile, the national security risks, economic and military, will worsen. Every single day that goes by, we are more vulnerable to very real threats to our energy supply: a major hurricane in the Gulf of Mexico, Iran closing down the Strait of Hormuz, terrorist actions against major oil production facilities, or an oil embargo by OPEC. Using the most reasoned and fact-based military judgment, members of the Military Advisory Board concluded that we must transform the way our country produces and uses energy. Diversifying our energy sources and moving away from fossil fuels is critical to our future energy security. This will inevitably mean moving to more renewable sources of energy, greater efficiency and to a significantly reduced dependence on fossil fuels. So if you ever run against someone who doubts the importance of climate change, you’ve now got the brightest minds of the US military on your side – in essence whose who deny the effects of climate change are essentially undermining United States national security. Claire had a fantastic opportunity this week – she was selected as a participant in the World Food Prize Symposium Youth Institute. Usually a teacher accompanies the student to the three day all-expenses paid trip to the symposium, but Claire’s teacher had attended before and asked if Linda or I would like to attend in her place due to our professional and personal interests in agriculture. 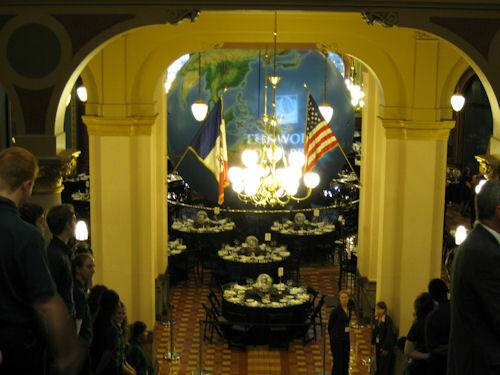 The ceremony awarding the World Food Prize, essentially the Nobel Prize for food and agriculture, was held at the Iowa State Capital Building. It was a formal affair. Here the students line the stairway, ready to greet dignitaries and attendees to the ceremony and dinner. 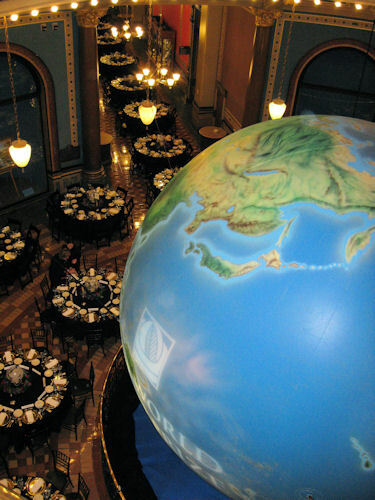 A huge illuminated earth was placed in the capital rotunda. 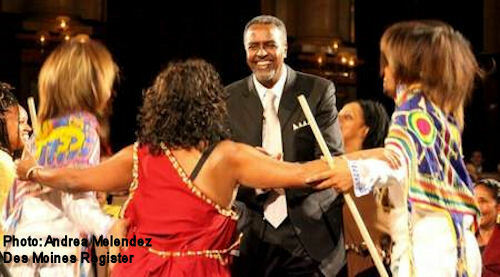 Here, winner of this year’s food prize, Gebisa Ejeta, gets down with dancers from his native Ethiopia as part of the ceremony. The actual ceremony itself was the only event that the accompanying teachers could not attend as the ceremony had sold out of the $450.00 dollar tickets. 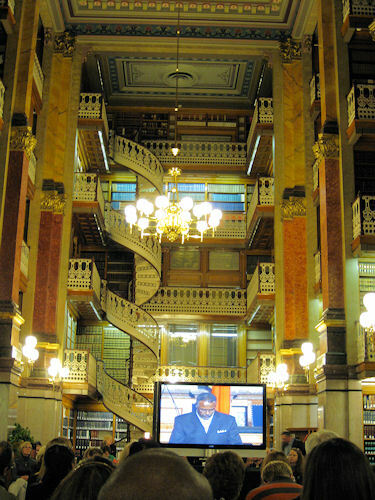 In the past, it had not sold out, so teachers attended live – instead we were ushered in to the state capital law library and watched the broadcast of the event live, as it was broadcast statewide and on the internet via Iowa Public Television. Sunday nights are always the same at high hopes. Kids get a reprieve from the usual 1/2 per day of computer or TV and get to watch a movie and eat mac and cheese. 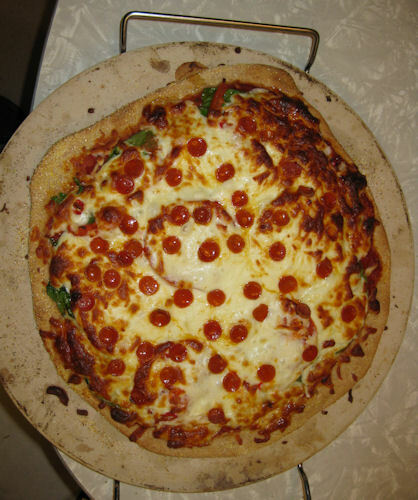 Later in the evening it’s date night for Mark and Linda as Linda makes a pizza from scratch. 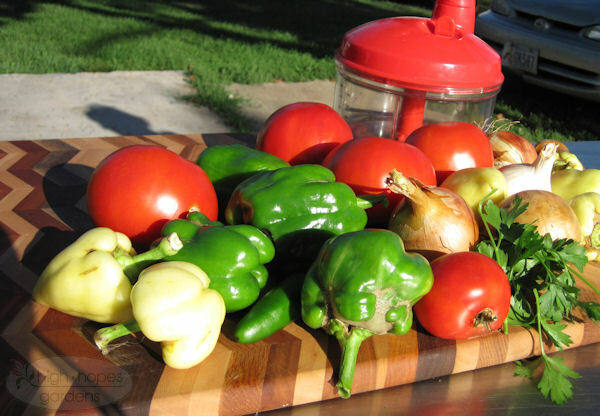 This is a good time of year – fresh from the garden – spinach, tomatoes, hot peppers and onions. Topped with some mozzarella cheese and tiny peperoni, the tomato slices are eager to poke through the cheese. I’ll spare you the details of the processing, but today might be a record canning day at high hopes! The girls spent about three hours peeling apples, and we had some bags of apples in the freezer from earlier maturing trees. We made nine canner’s worth of applesauce. 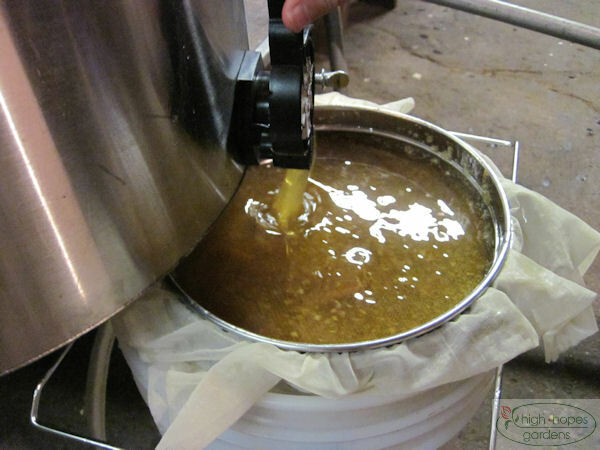 Apples take a while to cook into sauce, so nine batches is a good day’s output. 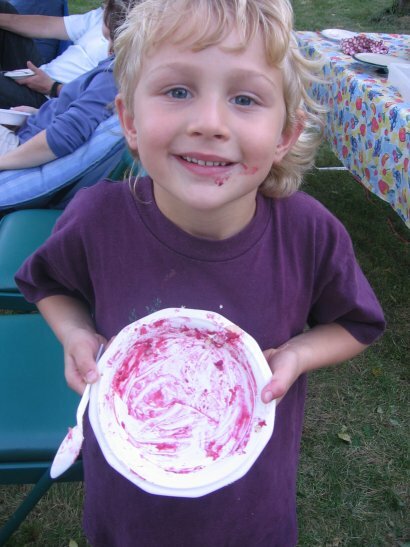 You’ll notice that the applesauce is red – we had a bunch of frozen strawberries, frozen cherries, and plenty of raspberries. So, the applesauce is mixed with those fruits – it is tasty! 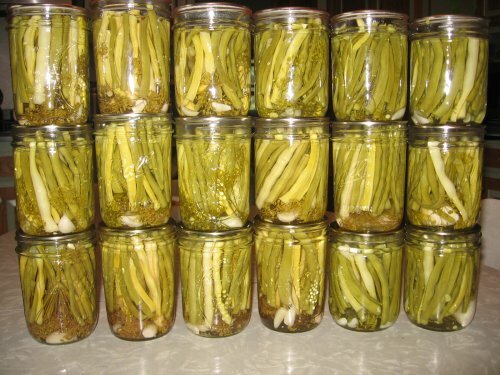 The total put up for the day is 28 quart jars, 35 pint jars, and 32 1/2 pint jars which are great for lunches. All in all, it’s the equivalent of about 53 quarts of applesauce. Fortunately (or unfortunately), there are still lots of apples left on the trees! While we were in Salem and Boston, we had the chance to eat some really great seafood and Ben and Jerry’s ice cream. A little restaurant I really enjoyed was a little seafood place with lots of open air places with a view of the sea. I went for lunch and I liked it so much, I went back for dinner the same day. 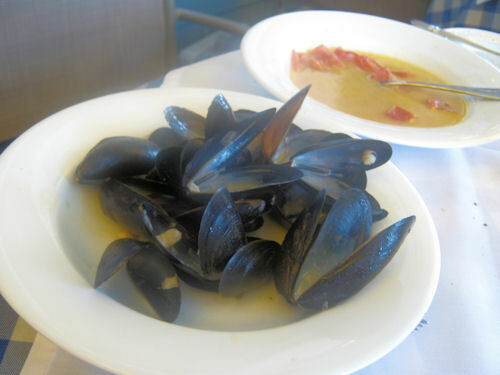 A devoured plate of mussels. A favorite with the group. 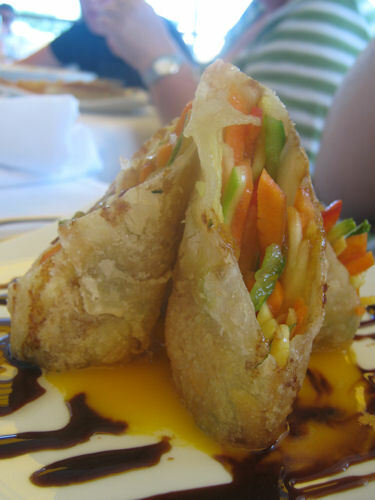 Very delicious spring rolls in a mango sauce. Not exactly seafood, but good all the same. 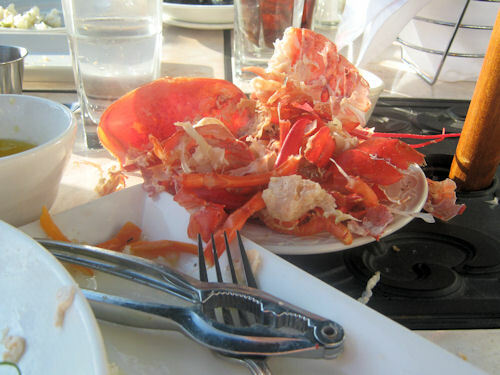 While at the seafood restaurant,Â I tried several new things including lobster, swordfish, and mussels. My personal favorite was the swordfish. Following a long standing tradition of getting a “vermonster” on the last night, We got three. In less than ten minutes, all there were clean and washed. 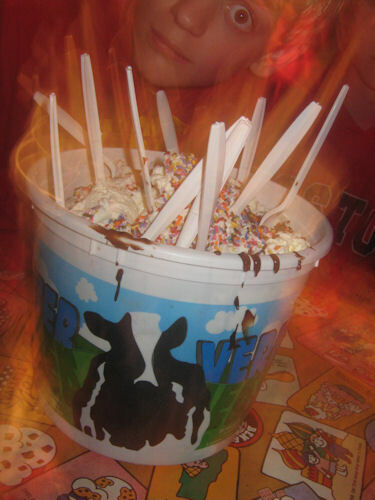 That’s approximately 60 scopes of ice cream, 16 ladles of hot fudge,Â at least 2 containers of whipped cream, a jar of sprinkles, 12 cookies,Â and 16 toppings including; gummy bears, bananas, Oreo cookies, and many others. It was, needless to say, very filling. A sweet end to and even better trip. 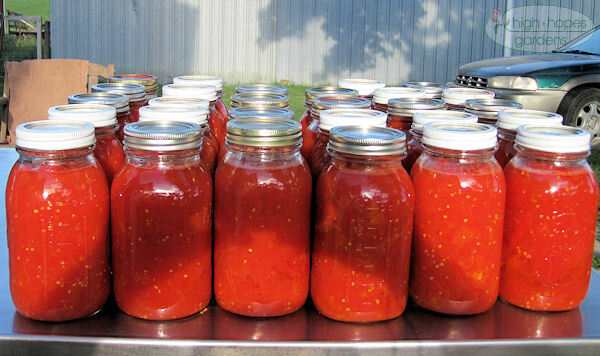 Today was the first serious canning day of the season. 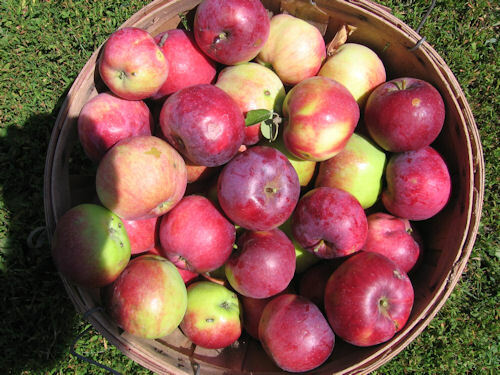 The first batch of William’s Pride apples were ready to be something else. 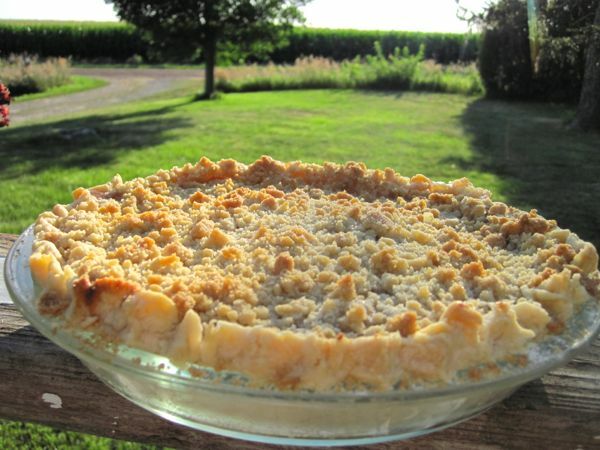 With last year’s great success of canned apple pie filling, we decided to make that first. The apple pie filling is in the center quart jars, a batch of dilly beans to the right and a couple batches of pickle relish to the left..
Here’s another interesting approach to marrying editorial content with advertising in a print newspaper. 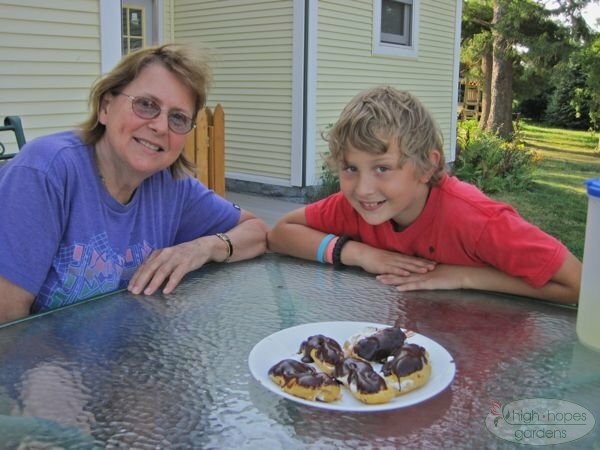 This kind of coupling of content with ads has made Google rich – now here’s an example of a print paper – the paper serving the Bar Harbor, Maine area – melding features with local food advertising. New concepts call for new names, so we have dubbed these new ads – Classifoods. Here’s a really new concept: the ads are free this month. Free ads are one per customer per week. General Manager Terry Carlisle cooked up the idea after attending a workshop in Boston at the annual New England Press Association (NEPA) convention in February. At the NEPA convention this year, one of the presenters was encouraging us to think outside the box using classifieds as an example. Why do they all have to run in the back of the newspaper? Why not marry them with their news content if that makes sense? He showed an example of a successful food classified page that was running in the Lifestyle section of a newspaper next to the food page. It was a recipe for experimentation. To introduce Classifoods to readers and advertisers, the newspapers are offering the ads for free for the month of June. After that, regular classified rates apply. Any food-related goods and services can appear in Classifioods – from seeds that grow into food to kitchen sinks where we clean up after a meal. Our first issue features a wide variety of foods, including pet foods. 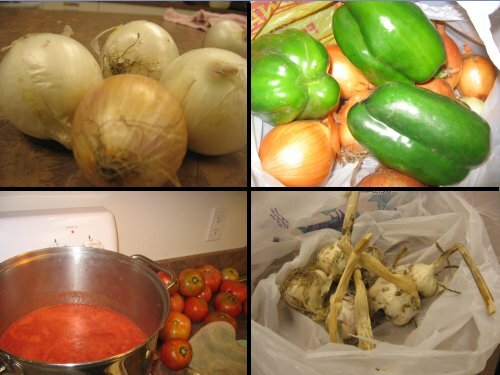 Over the past few years there have been a number of web sites that challenge people to eat local foods. One I remember was a site where each week people posted a photo of a locally-sourced meal and told about it, giving mileages for each item. 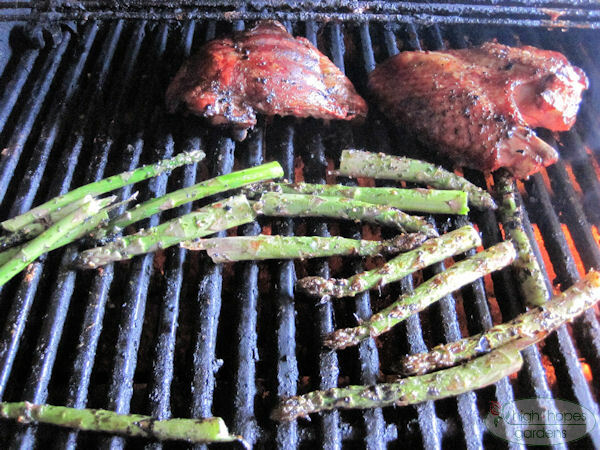 It’s harder in the midwest to do that at the end of winter, but tonight we had a meal I thought I’d share. 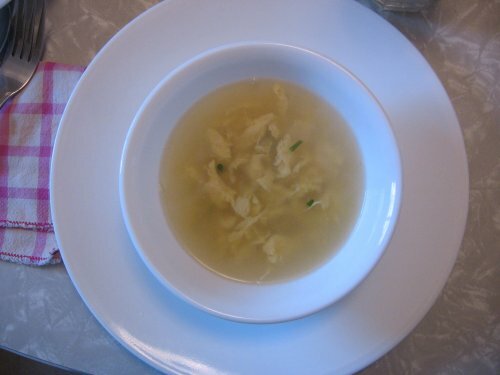 Egg drop soup with real free-range eggs from our farm and the first green harvest of the year – some chives from the herb garden can be seen adding a splash of color to the soup. 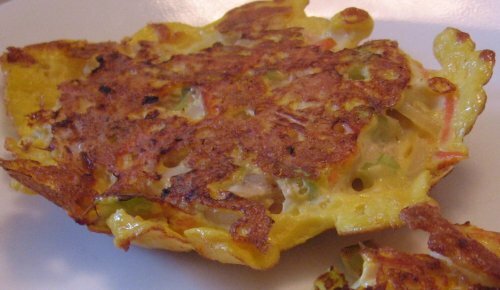 Second course is egg foo young, featuring, eggs from the farm, and chicken from last year’s broilers. 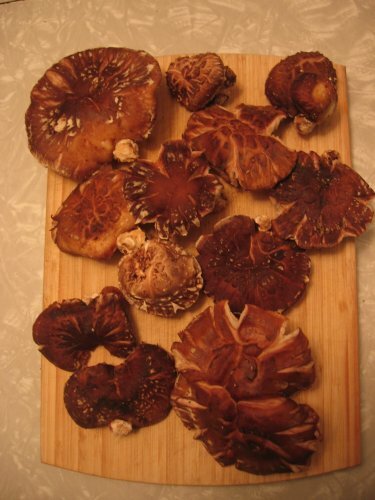 We look forward to an increasing percentage of farm-raised ingredients in our meals. Once again this year we are offering gift boxes with hand-made goodies from our farm, including hand-made goat milk soap, jams from organic fruit, and beeswax candles. 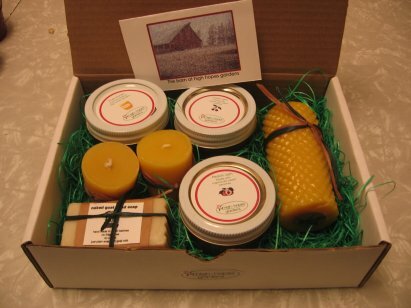 This is the large sampler box with jam, honey, goat milk soap, a beeswax pillar candle and twoÂ votive candles offered for $25. 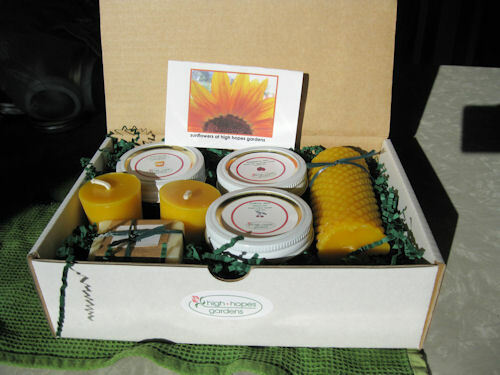 This is the medium sampler box with jam, honey, goat milk soap, a beeswax votive candle offered for $15. 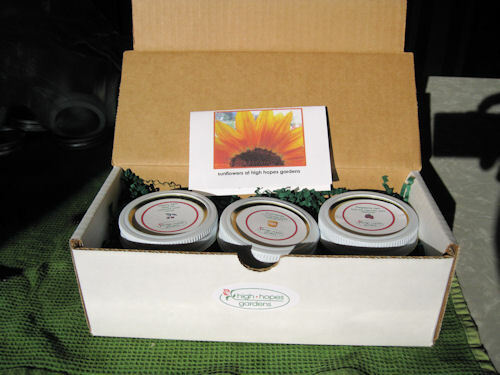 This is the small sampler box with three kinds of jam made with organic fruit from the farm offered for $10. We offer these first to our regular customers but have a few left, so we are showing them on the blog. 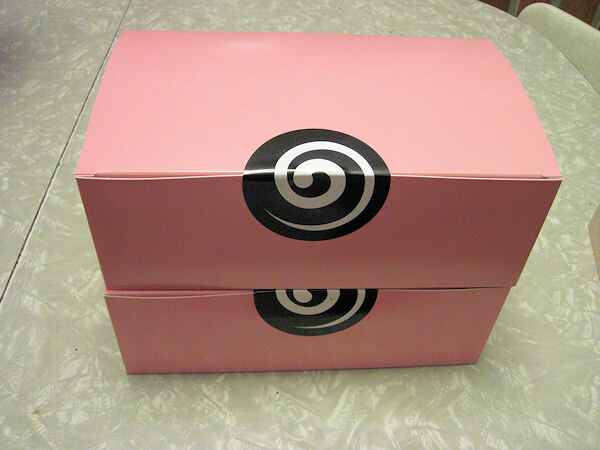 They are in mail-ready boxes and we can mail them to you or your gift recipient for just the actual shipping charges. Contact us if you’d like to order some or get a shipping estimate. 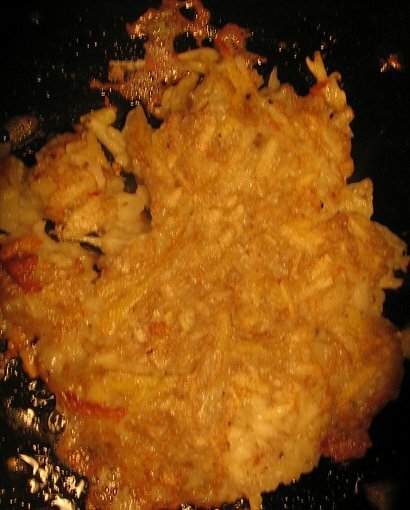 It’s the time of year for the annual latke fry at hgh hopes. 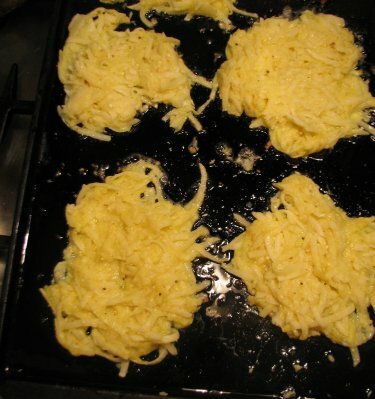 The kids were very excited to find out it was latke night. There was actual utternaces of joy and clapping. As a bonus, the potatoes, eggs, and onions were all straight off the farm. I think we needed a snow day. Yesterday while everything was shut down outside, it was time for something completely different. 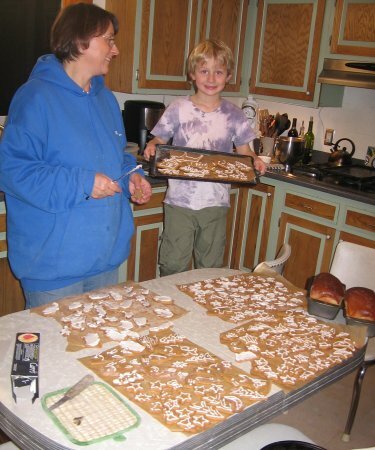 It was time to make gingerbread cookies and homemade bread! The tasks that should availed themselves (house cleaning etc,) were just too risky because you just never knew when the power might go out in the middle of vacuuming a rug! Â So, it was cookies and bread. Martin loves the honey wheat bread – so much so he calls it “dessert” and doesn’t want anything on it. He even wanted to bring a PB&J sandwich to school instead of a school lunch of corndogs! 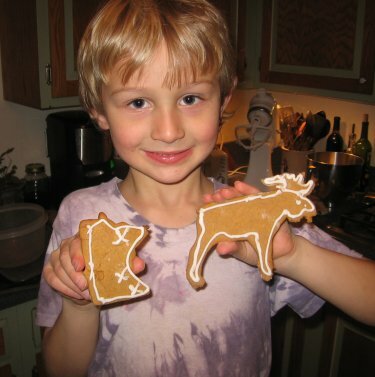 Here Martin shows off his moose and Minnesota cookie with important places in Minnesota for him marked with an X. He’s at the age where he loves cooking. 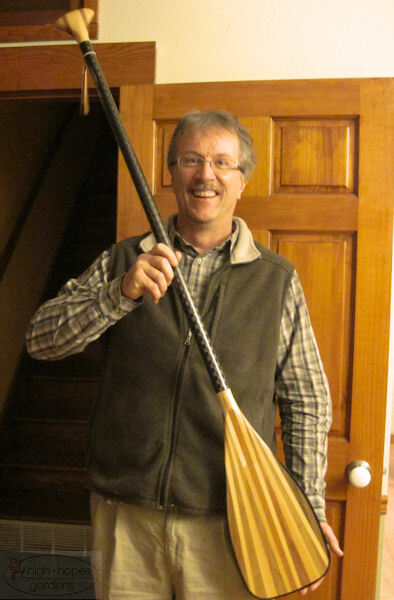 A few days ago we were working in the attic and as soon as we got up, I realized I needed another tool, so asked him to find a good radio station on the dial while I went to fetch it from the garage. When I got up,he had dialed into NPR and was listening to Lynne Rossetto-Kasper on the “Splendid Table” and he was all excited because they were talking about spices and reported that most cinnamon in the stores is fake. Today was another big picking day – both raspberries and apples. I even got tired of picking raspberries today. 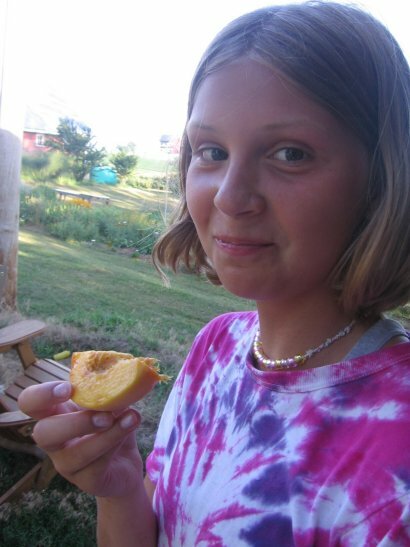 We also started on the peach harvest, they seem to ripen better off the tree. But those will be for another day. 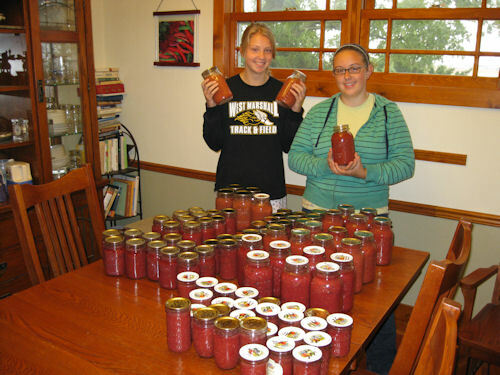 So, 24 more jars of canned raspberries, 11 pints of peach-applesauce, and 22 pints of raspberry-applesauce. The apple sauce was from some apples we had peeled and frozen earlier in the season, plus some apples the girls picked and peeled today. 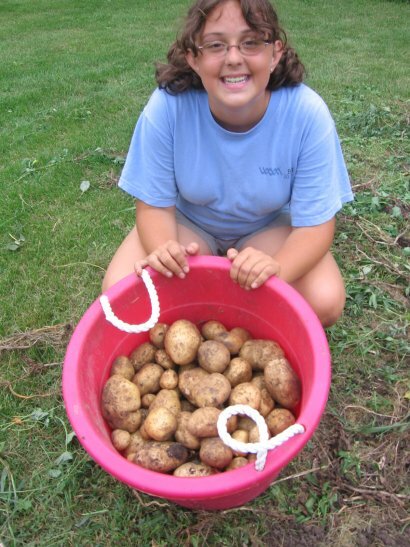 ‘Tis the season for harvest. 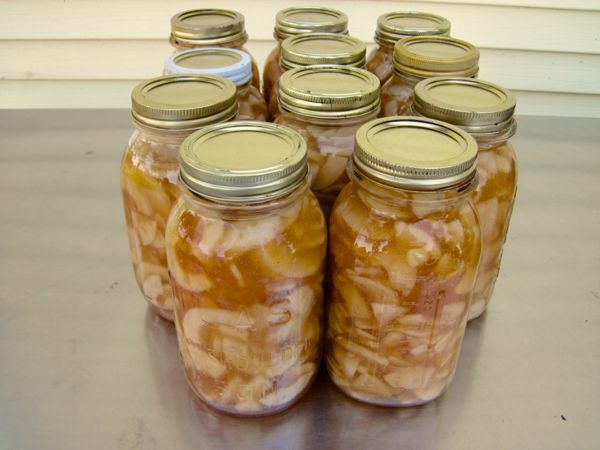 I was thinking, although it might seem like a lot, 33 pints of applesauce is not even one jar a week. 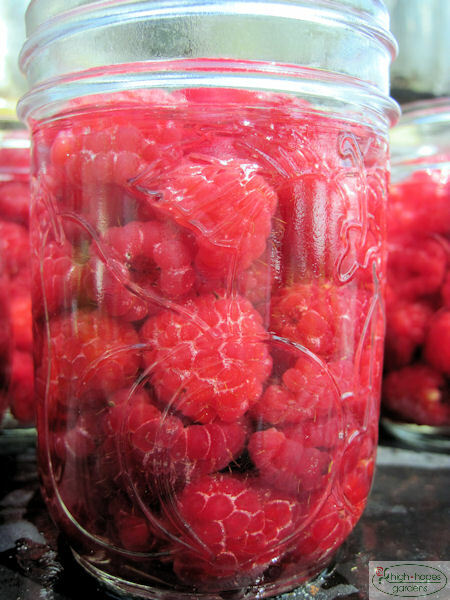 OK, you can subtract summer months when other fruits are in season, and that leaves us with one jar a week from today’s batch! 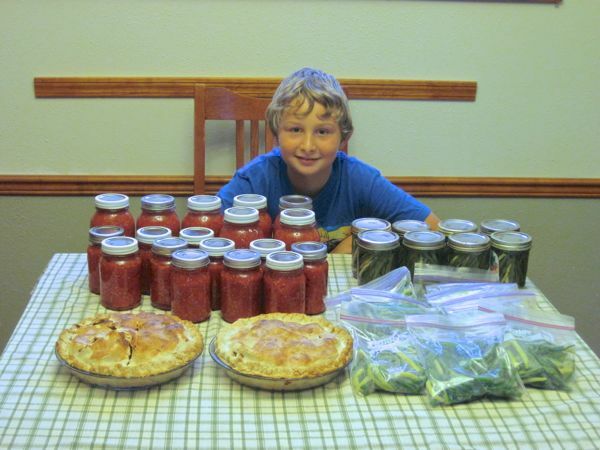 Today was another big canning push. 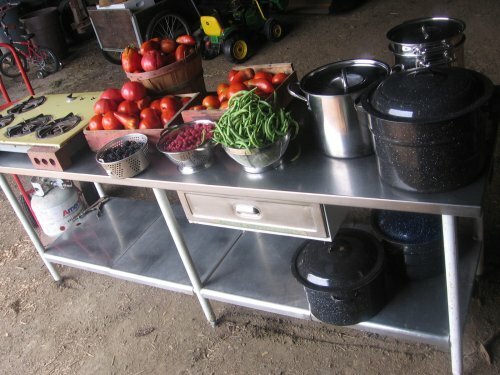 We moved the stainless steel table out under the shade – the heat has returned, but not the humidity. 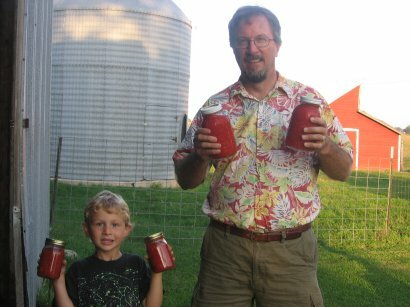 Today’s haul was 35 quarts of tomatoes and about 55 jars of raspberry jam. It’s not bad with many hands. 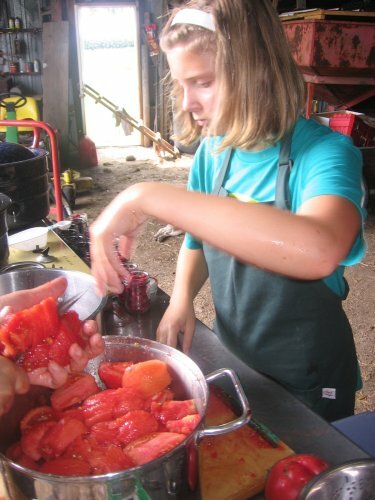 One of Emma’s favorite tasks is blanching and cutting up tomatoes. 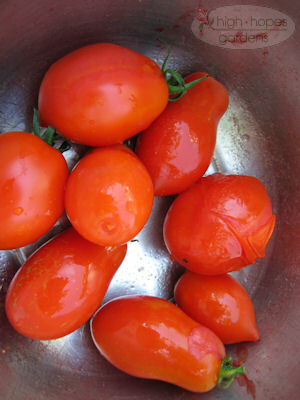 Even after all this, we still snarfed down sliced tomatoes at dinner – it’s hard to get sick of something so good! Finally, the meal begins! We’re not sure exactly how many people ate, but it may have been around 110. 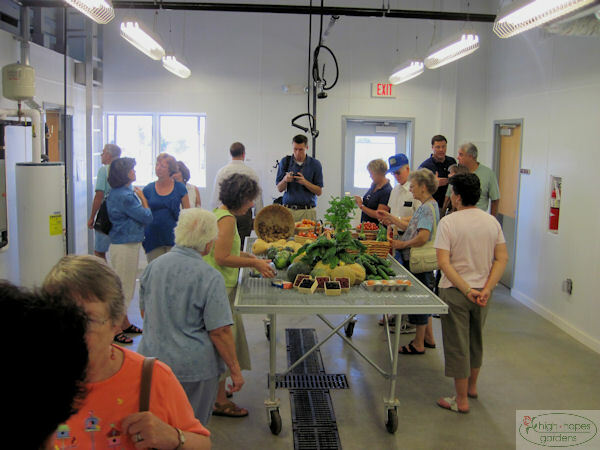 The first people move through the local food line. We used up all the plates and forks! The dishes all had notecards explaining what the dish is and the source of the food. 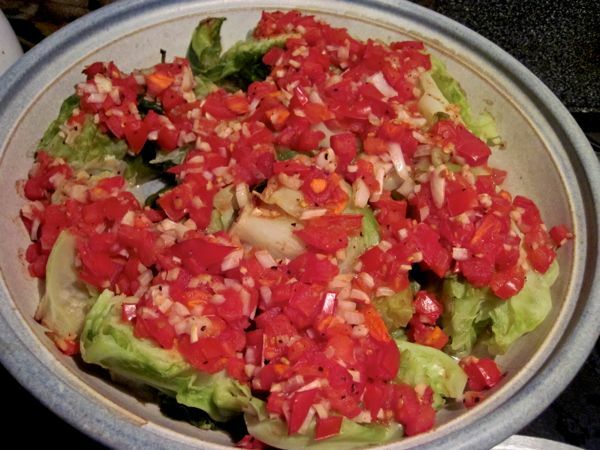 This is one dish that Iowans can eat locally year-round – salsa and corn tortilla chips. 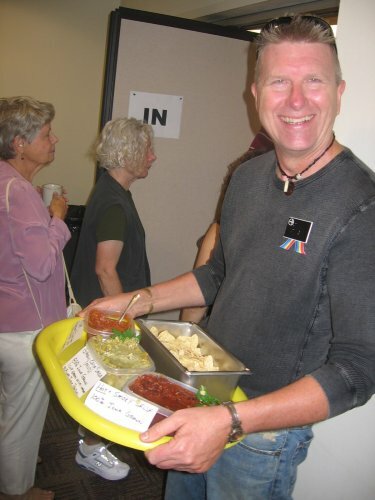 I enjoyed eating from the mobile salsa tray! Finally, the meal is over and the event grand organizer can breathe a sigh of satisfactionÂ following aÂ first-time event pulled off successfully. 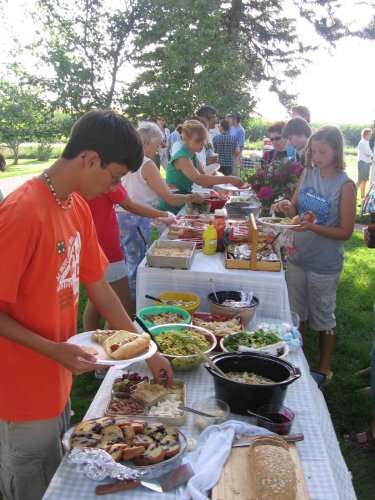 Today the preparations started for the all-Iowa lunch after church tomorrow. 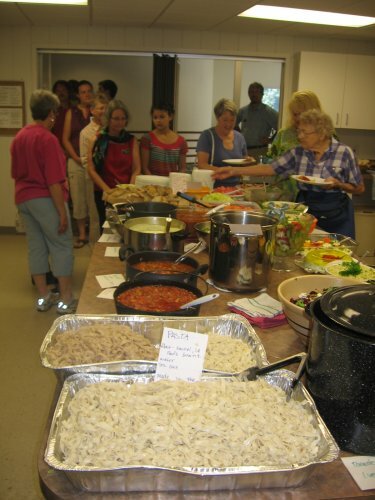 As part of the focus on sustainability this month in church, we helped plan a local meal for the congregation – so they could taste what local cooking can be and be mindful of where their food comes from. 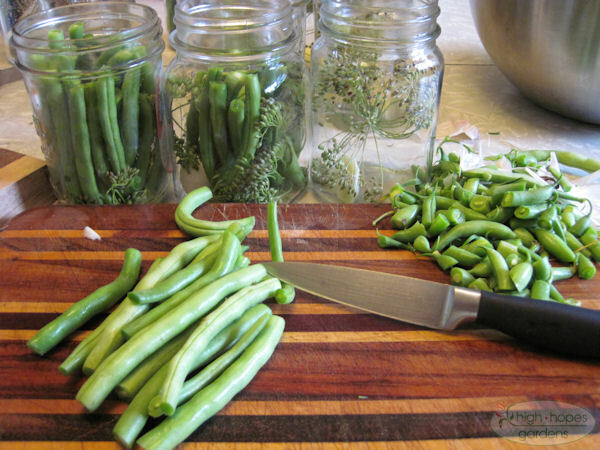 When you start out with fresh, local ingredients, it’s hard to go wrong. 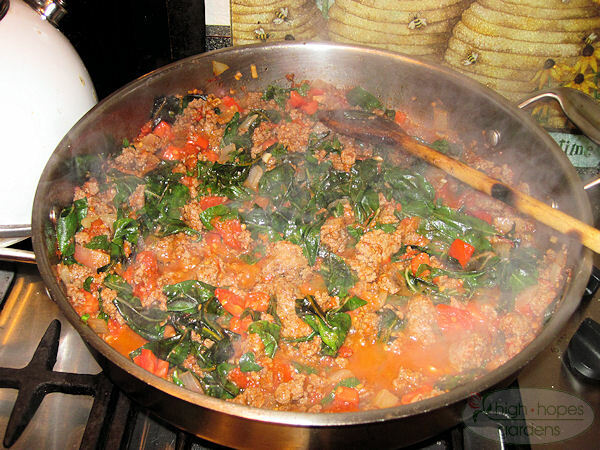 This meal was from scratch – we even picked up flour from Paul’s Grains in Laurel and the crew made pasta from scratch. 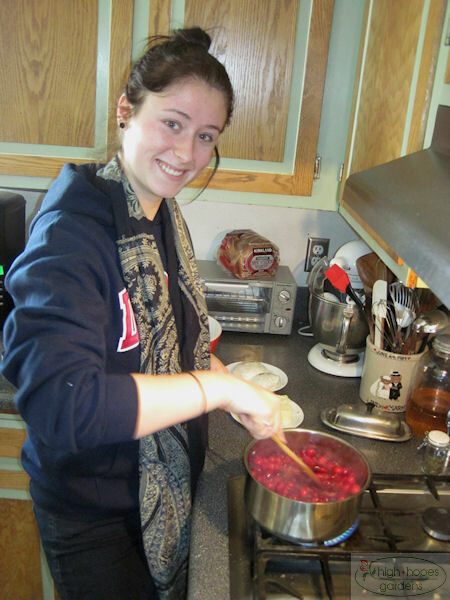 It was an afternoon of cooking, fun (and even some impromptu dancing) to get ready for the meal the next day. The woman Claire is dancing with is a good person to know – she was born in Venezuala and then moved to Italy before ending up here. Now there’s some cuisine! Linda decided that being this kind of church lady is a good thing! 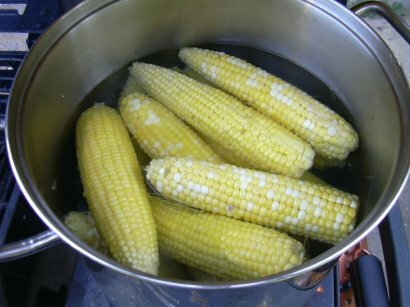 I thought I’d post the list of local food resources (many, but not all are specific to Iowa) for those of you asking – where do I find good local food? “One of the ten best books of 2006” – the New York Times. 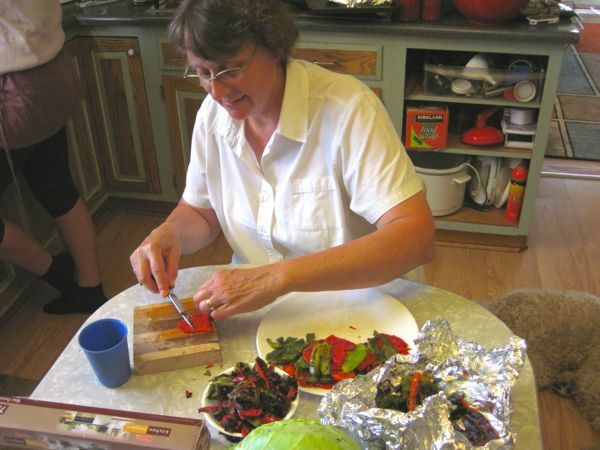 Pollan delves deeply into the natural history of four meals and traces the source of the food back to the source, whether in an Iowa cornfield with UUFA member George Naylor or hunting a wild pig in Northern California. In this intriguing yet unsatisfying volume, the author chronicles a year of striving for a diet consisting of 90% native flora and fauna, found within 250 miles of his Arizona home. Nabhan is an ethnobotanist with an interest in seed preservation and director of the Center for Sustainable Environments at Northern Arizona University. The authors of this charmingly eccentric memoir decide to embark on a year of eating food grown within 100 miles of their Vancouver apartment. 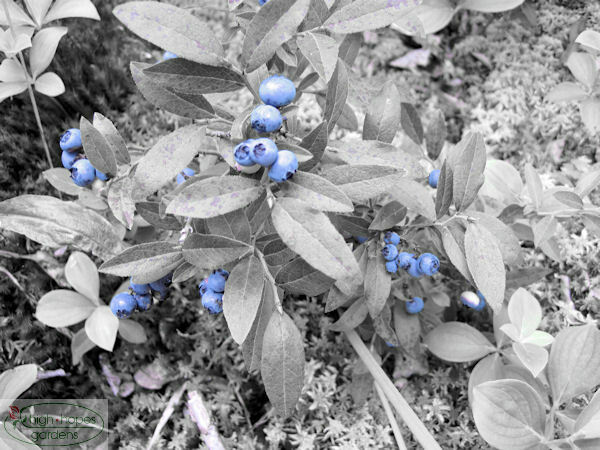 Thus begins an exploration of the foodways of the Pacific northwest, along which the authors, both professional writers, learn to can their own vegetables, grow their own herbs, search out local wheat silos and brew jars of blueberry jam. They also lose weight, bicker and down hefty quantities of white wine from local vineyards. Schlosser’s incisive history of the development of American fast food indicts the industry for some shocking crimes against humanity, including systematically destroying the American diet and landscape, and undermining our values and our economy. A version of Fast Food Nation for underage readers. The charismatic leader of the Slow Food movement, Carlo Petrini, outlines many different routes by which we may take back control of our food. The three central principles of the Slow Food plan are these: food must be sustainably produced in ways that are sensitive to the environment, those who produce the food must be fairly treated, and the food must be healthful and delicious. 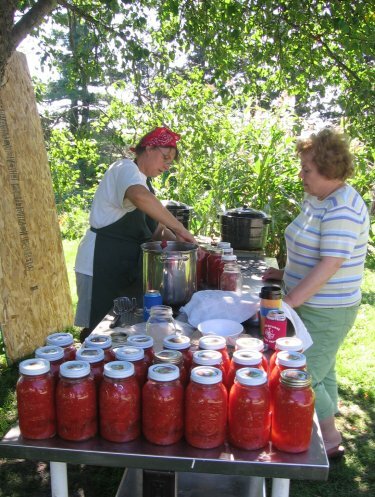 Today was the first big canning day of the season. 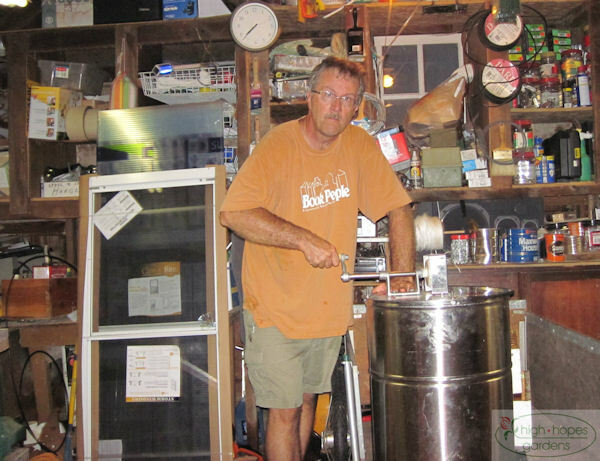 Â We had made a few batches of jam earlier, but this is the first time we rolled out the stainless steel counter and old cooktop from the house and set up in the shed, since there was a chance of rain and it was hot out in the sun. All the “stuff” ready to go. It beats making the big mess in the kitchen. 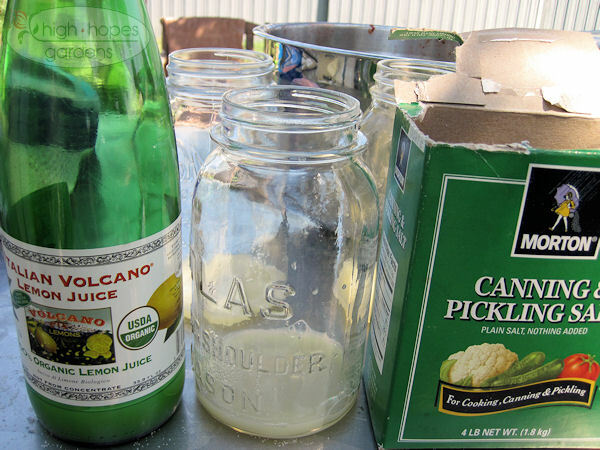 Martin got the jars ready for tomatoes – he measured out the lemon juice (for acidification to allow boiling water canning instead of pressure canning). 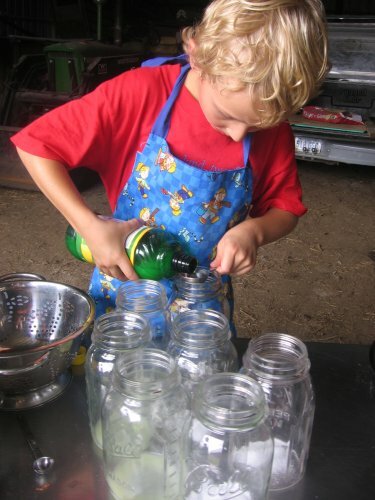 He also measured out the salt for the jars as well – stylistically decked out in his “Bob the Builder” apron! Can we can it, yes we can! 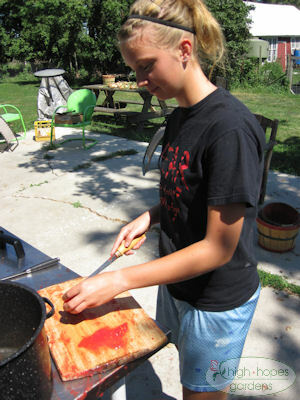 Emma’s job is to help blanch the tomatoes to getÂ the skins off beforeÂ making the crushed tomatoes. 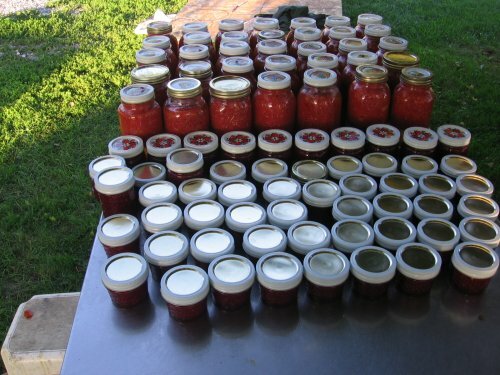 Finally, the afternoon’s haul – 24 quarts of tomatoes, a few jars of blackberries and raspberries, along with the frozen beans. 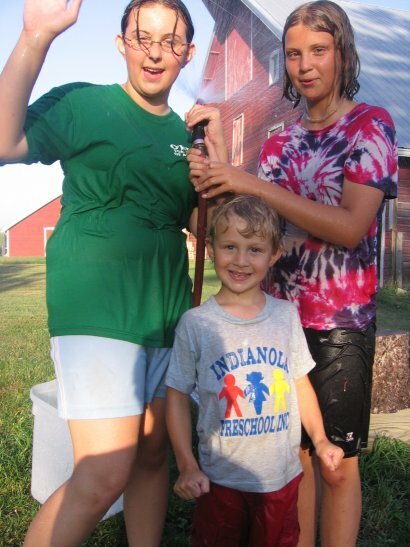 August 11, 2007 – Party on the Farm! 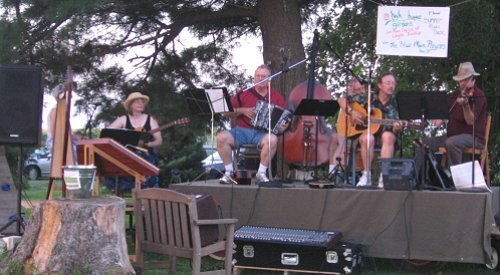 In our quest to remain the undisputed “Live Music Capital of Logan Township,” (of course a township is a block of land 6 x 6 miles) we hired the Blue Moon Players and threw a party. We hope this is the first of many such summer events. There’s something nice about live music out in the country, with the wide-wide world of the farm and barn for the kids to run wild in. The older folks can forego the games of Sardines or capture the flag by sitting in the shade and listening to some great music. 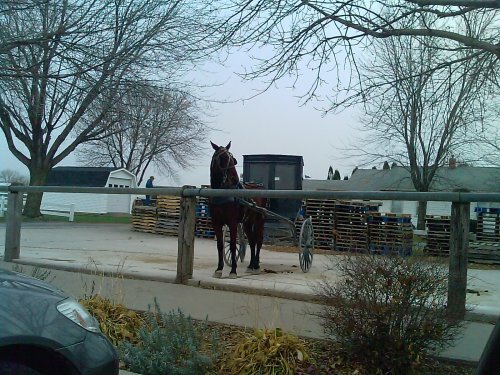 For my money, any time you’ve got an upright string bass propped up on your hay wagon, you’re living the good life! The day was incredibly hot, but we all managed just fine. 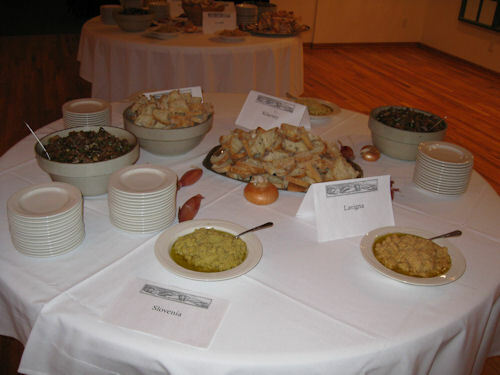 Of course, no party is complete without a spread of food, so here’s the food table showing some of the delights of a midwestern potluck in August. 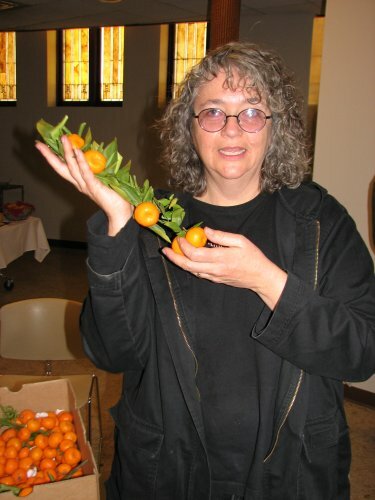 There’s a fairly new web site put out by the Iowa Arts Council and the Leopold Center for Sustainable Agriculture all about foods that have a story that connects to this place. I’ll share with you the site’s opening paragraph to entice you to go there and poke around. 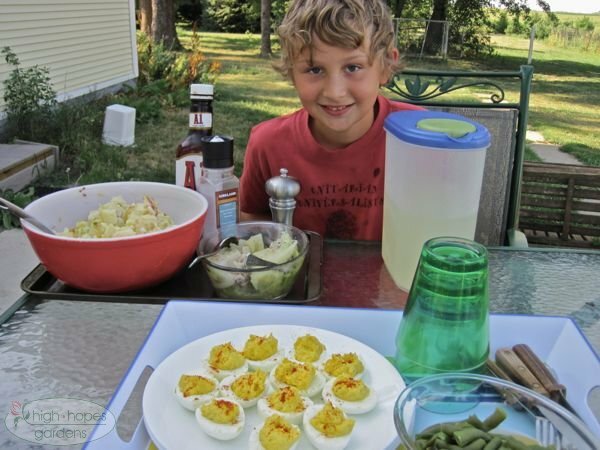 The site is called Iowa Place-Based Foods and it is worth a spin. 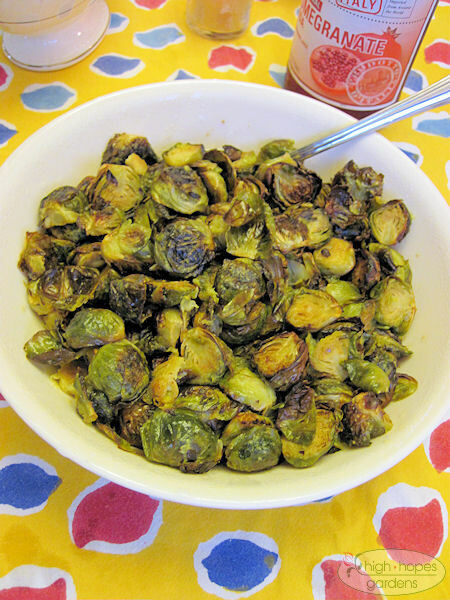 OK, OK, enough of the clamoring for the Senator’s favorite recipe! If it’s good enough for a Senator, it is surely good enough for the intelligent readers of this blog. 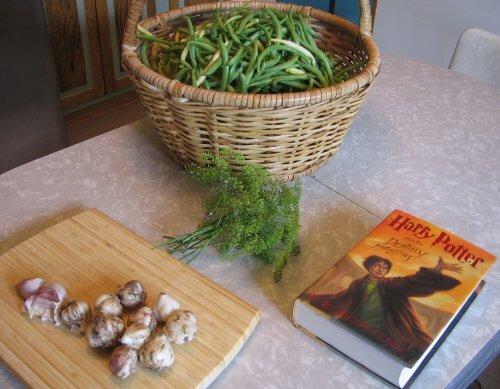 Of course, to really match the flavor, use home-grown ingredients. The particular dish so favored by the Senator contained ingredients right from high hopes gardens (only the beans, salt, and cumin were sourced from the store!) the rest were frozen or stored from last summer. 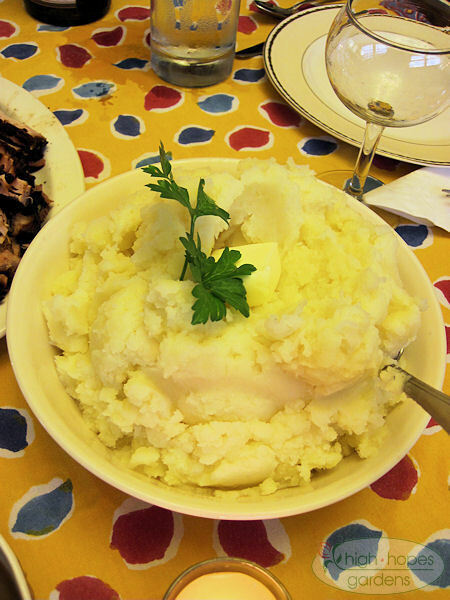 This recipe comes from the Better Homes and Gardens Crockery Cookbook. 1. In a 3-5 quart crockpot, combine the drained beans, chicken, onion, sweet pepper, jalapeno peppers, garlic, cumin, salt, and oregano. 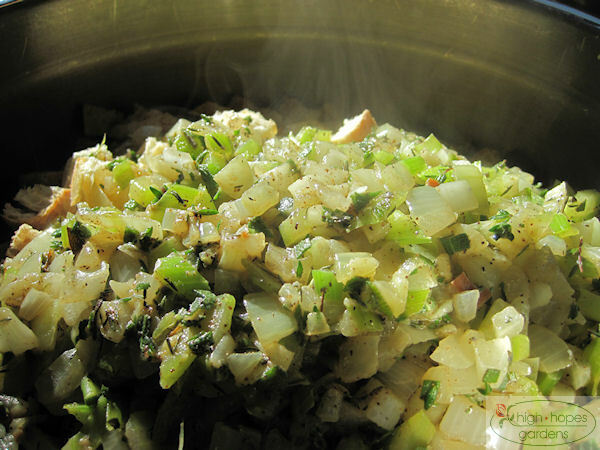 Stir in Chicken broth. 2. 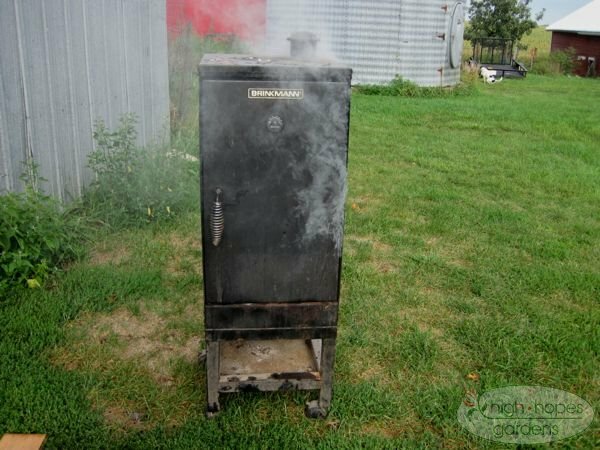 Cover; cook on low heat for 8-10 hours or high for 4-5 hours. 3. Ladle the soup into bowls. Top each serving with some cheese and tortilla chips if desired. Makes 8 servings. 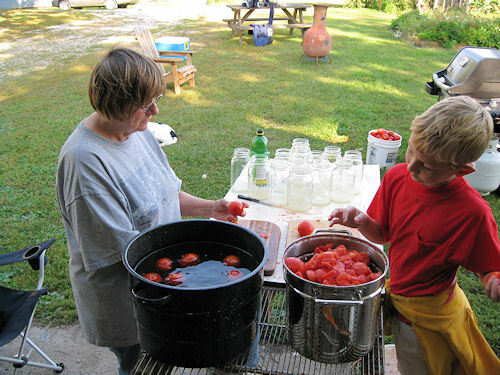 Today the good people at Two Friends Farm hosted an unofficial Slow Food gathering. Here’s a brief description of the movement lifted directly from their web site. 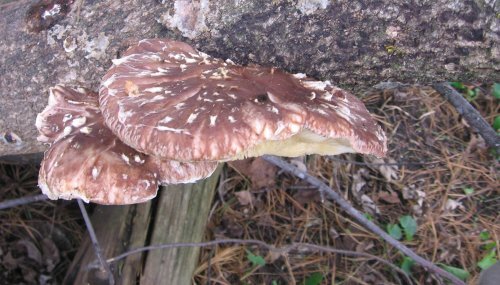 Slow Food U.S.A. is a non-profit educational organization dedicated to supporting and celebrating the food traditions of North America. From the spice of Cajun cooking to the purity of the organic movement; from animal breeds and heirloom varieties of fruits and vegetables to handcrafted wine and beer, farmhouse cheeses and other artisanal products; these foods are a part of our cultural identity. They reflect generations of commitment to the land and devotion to the processes that yield the greatest achievements in taste. These foods, and the communities that produce and depend on them, are constantly at risk of succumbing to the effects of the fast life, which manifests itself through the industrialization and standardization of our food supply and degradation of our farmland. 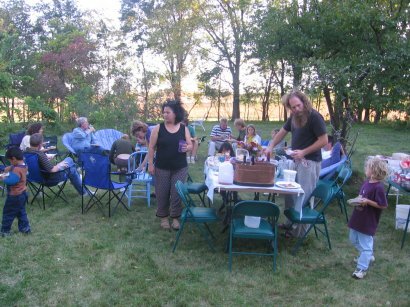 By reviving the pleasures of the table, and using our tastebuds as our guides, Slow Food U.S.A. believes that our food heritage can be saved. 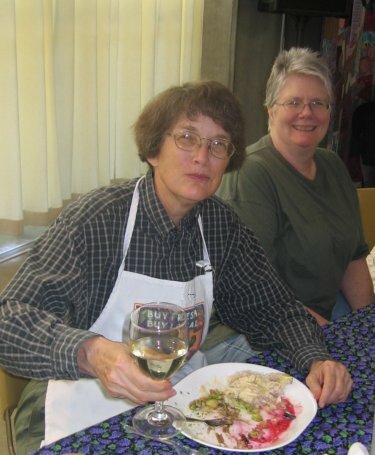 There was a great mix of folks – organic farmers, owners of Marshalltown’s only white tablecloth restaurant, recent immigrants, jambalya-toting former Lake Charles LA residents, a doctorate student in snake biology among others! 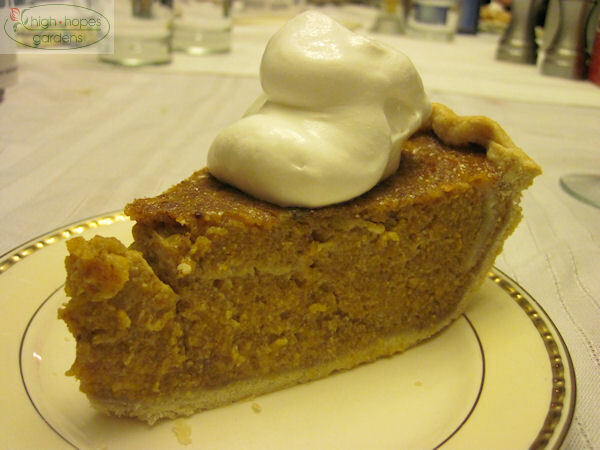 This is what it’s all about – if only manners didn’t prevent us from eating with such gusto! 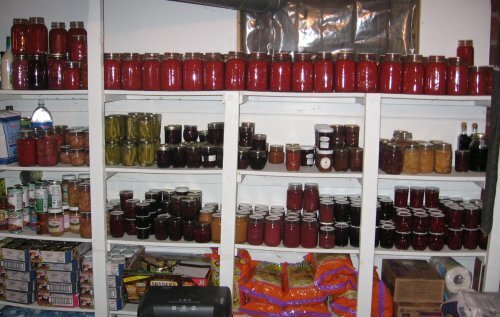 Yesterday was a marathon food preserving day. 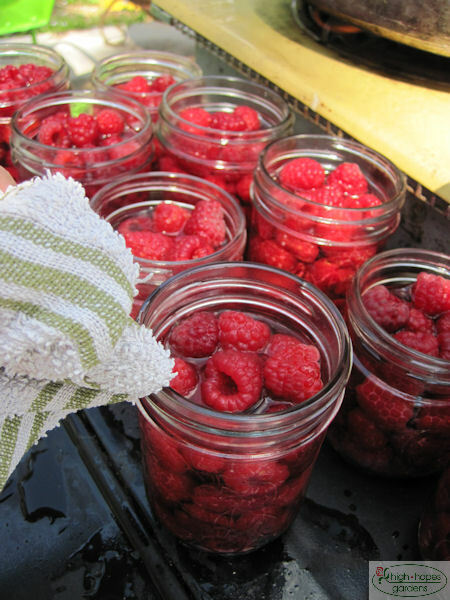 Some of the jobs are quick – like the berries, just put whole berries in jar, fill with light syrup (sugar and water) and put in boiling water canner for 10 minutes. 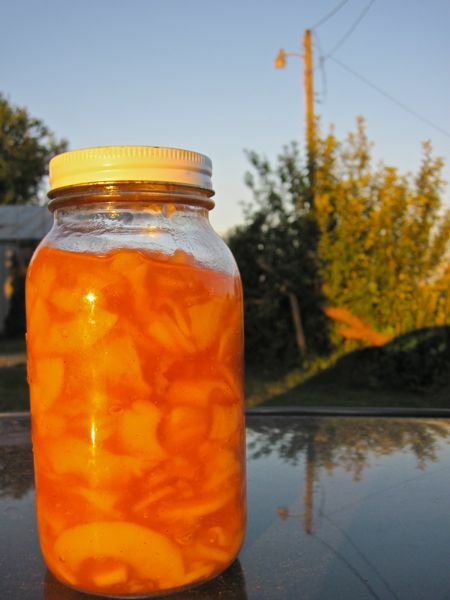 Other jobs are more lengthy – like the peaches, blanch the peaches and slip off the skins, cut to remove pit, add some light syrup and bring to boil, then pack in jars and put in boiling water canner for 25 minutes. The kids love the peaches and I love the berries on cereal and in yogurt for breakfast. 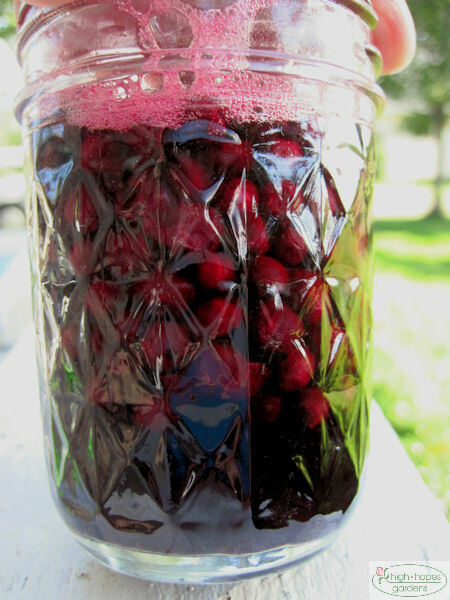 It’s great in the winter when the fresh fruit supply dwindles, to be able to reach for a jar of fruit to add to any meal. 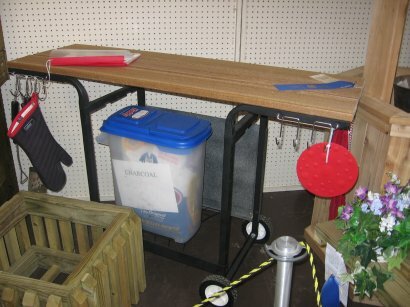 These are some of my favorite projects (that I’d like to copy) from the 4H building at the state fair. These are all from high school and younger 4Hers. 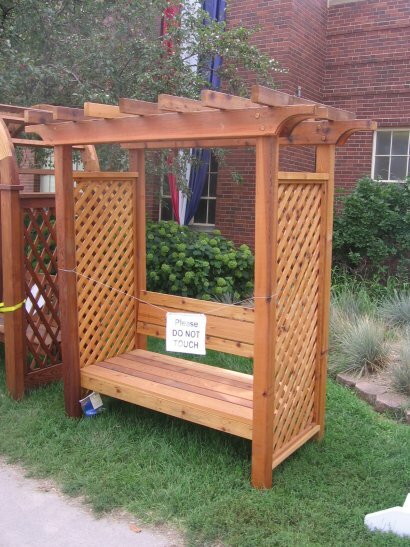 This arbor seat would look great in the garden. 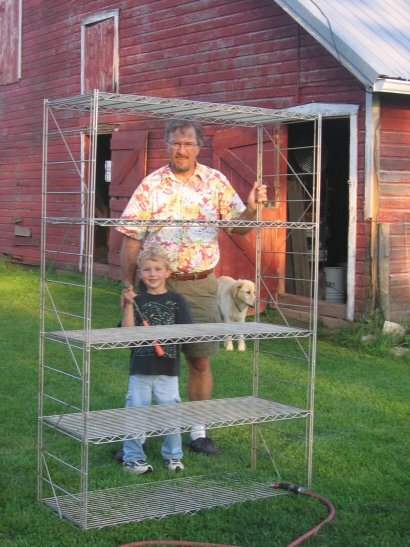 I wish I would have thought of this before building my walk-through arbor. 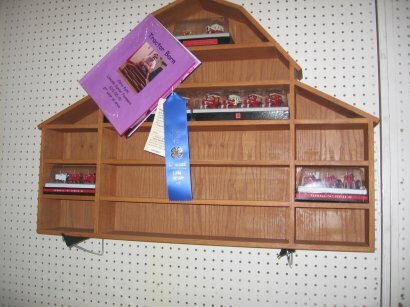 I like this barn-shaped shelf to display toy tractors. I remember seeing these a long time ago, but not recently. We’ve been struggling with the best way to put a sign up for high hopes gardens, and I think this is it! This entry wins in my re-purpose a broken item – it’s an old broken metal bar-b-q, with the main part removed and the framework reworked with weatherproof decking for a bar-b-q-buddy. 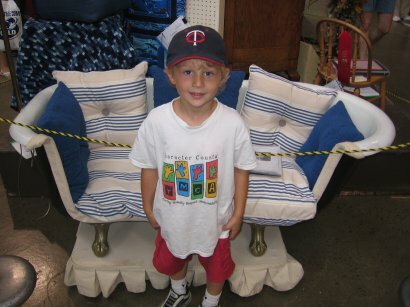 This was a creative re-use of an old claw-foot tub – it has been refashioned into a love seat. Martin wanted to crawl in and lay down. It would be great for sleeping through tornadoes in! Finally, a quick update from the farm. Another 1.25 inches of rain fell yesterday, so we are up to over 3 inches in the last week – more than June and July combined. 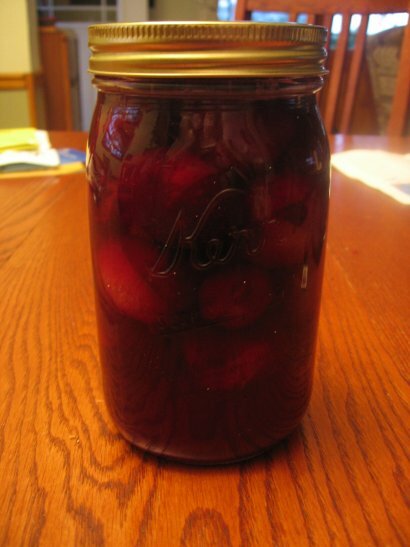 We had a few leftover plums, so ended up with 21 quarts of canned plums. 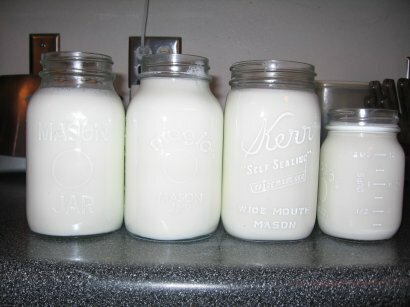 Martin poked the skins with a fork and packed them in the jars and had great fun doing it. Happy July 4th! 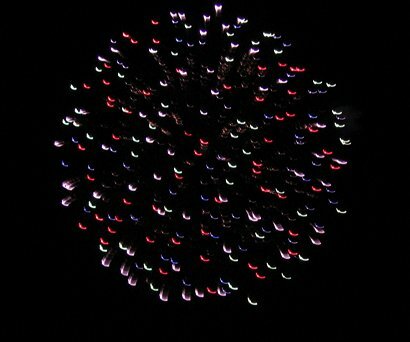 It’s wonderful to watch fireworks through the eyes of a 5 year old. One of today’s tasks was to put up broccoli. We even caught it this year before any heads turned to flowers! 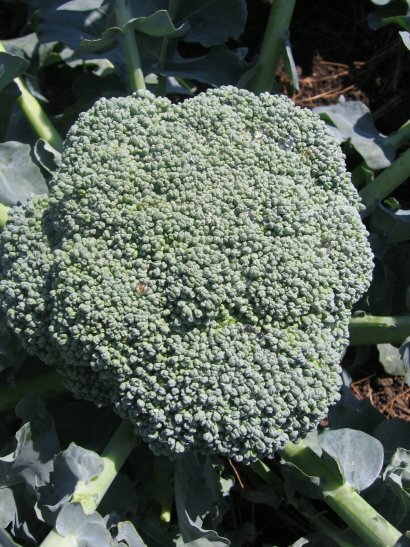 Broccoli out in the garden, unaware of the knife poised at it stem. 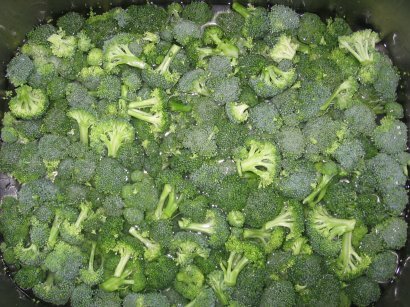 Broccoli florets floating in the sink in salty water – driving any insects out. 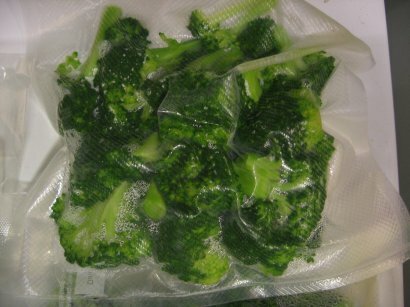 Finally, vacuum sealed broccoli vacuum sealed after blanching and cooling. I even chopped up the stems in the food processor and cooked it with the chicken broth from last week’s butchering and froze it to make cream of broccoli soup. 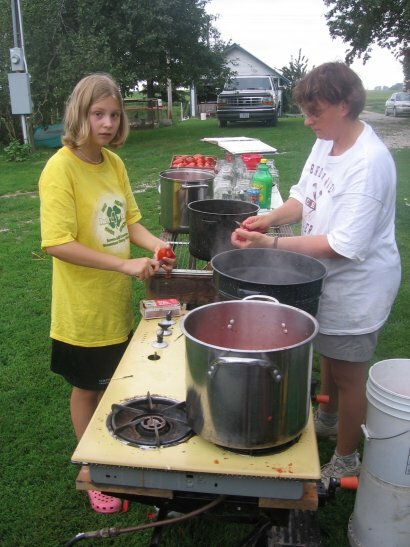 We’ve instituted the summer schedule – which gives the girls responsibility to each cook a meal every week. 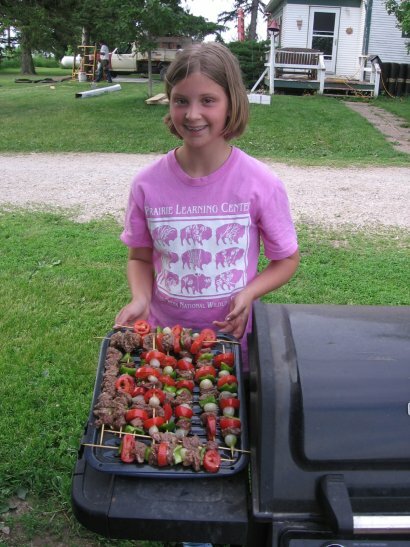 Emma’s first meal was a shish-kabob, even with the meat marinated a day ahead. Two sides of the house re-roofed! 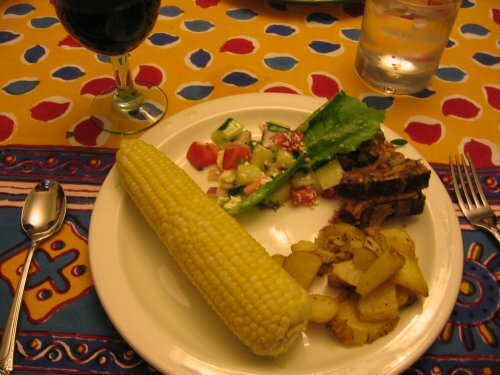 May 8, 2006 – Local Food! 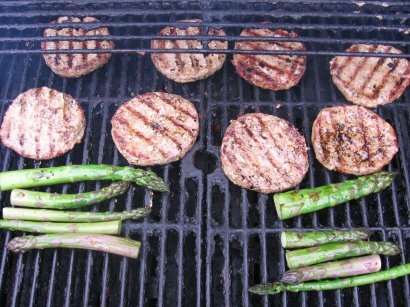 asparagus from our garden, “happy pork” burgers, and our own milk. 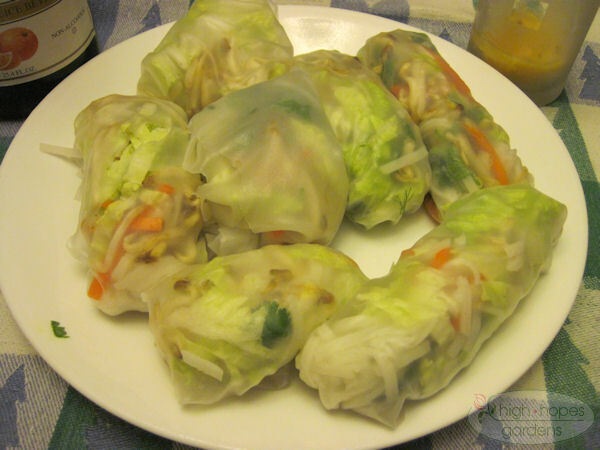 Add some spring rolls from Costco (not local) and you’ve got a meal. 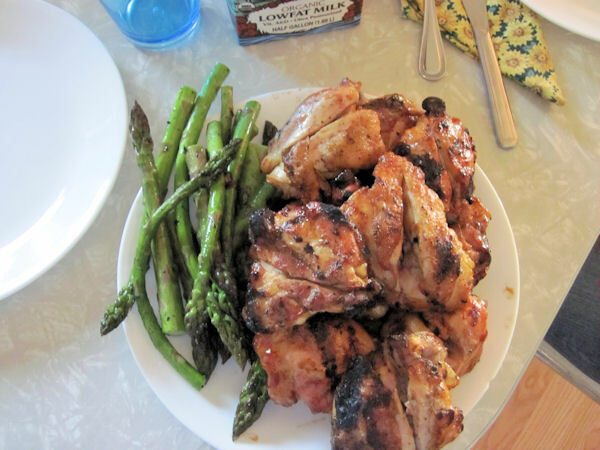 Got broiler chick arrival and butchering arranged today – the first batch of 110 should arrive Thursday or Friday. Also ordered the organic nutri-balancer from Fertrells to have the local elevator mix in with the poultry ration. We started the mushroom “planting” today. 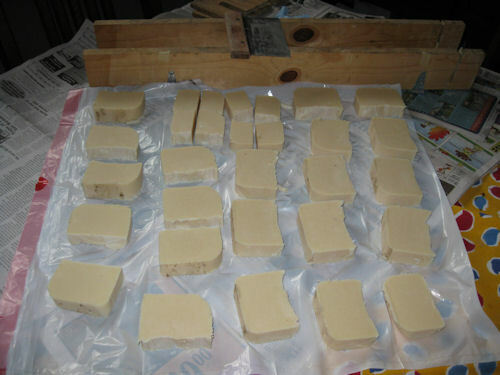 The dowels innoculated with shitaake mushroom spawn arrived and the logs were previously cut and ends waxed and ready to go. Martin is holding the bag of spawn. 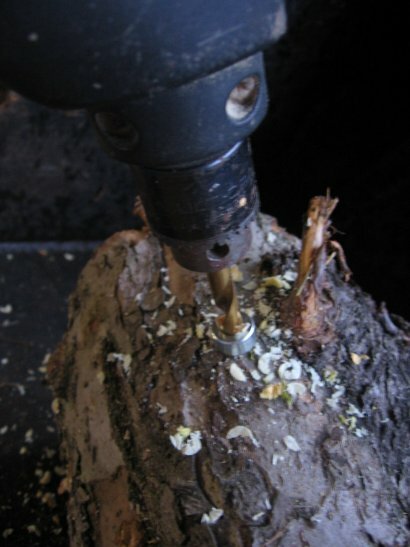 First holes are drilled in the log to one inch with a drill and collar. They are spaced about 6 inches apart in rows about 2 inches apart. 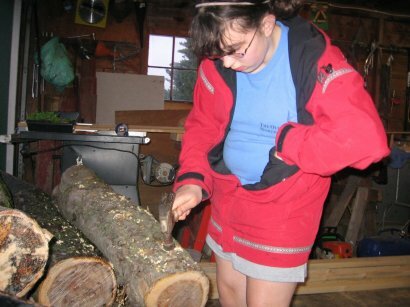 The dowels are pounded into the logs next. 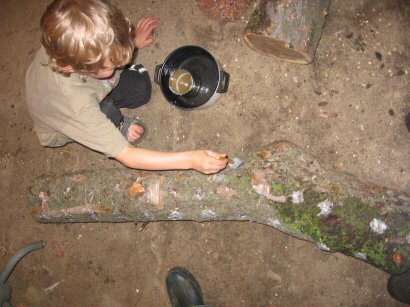 Finally, wax is put over the holes to seal them up as the log needs to stay moist. According to the directions, we should move the logs into a shady spot, keep them moist, and in 6-18 months the picking should begin! This is a job that requires many hands and everybody can help. 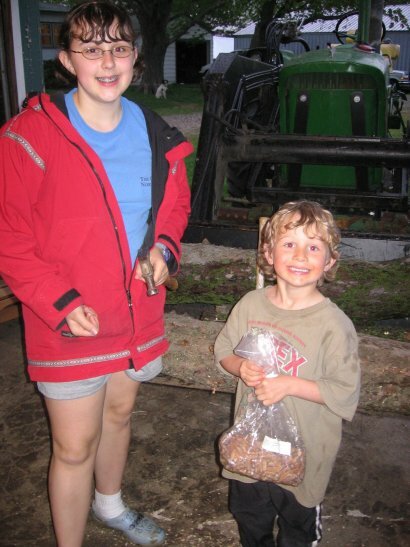 April 25, 2006 – Got Milk? Here’s the output from Blaze and Paullina (still with three kids nursing between them). We’re just milking once a day now. 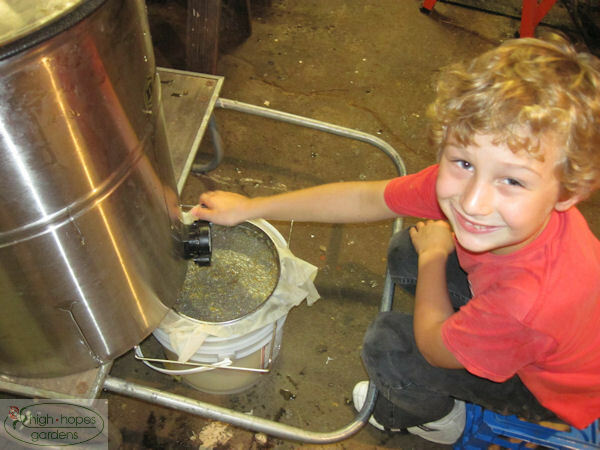 It’s time to put milk away for soap and making yogurt! Today was a very cool August day – a nice change – it didn’t get to 70 until mid-afternoon. 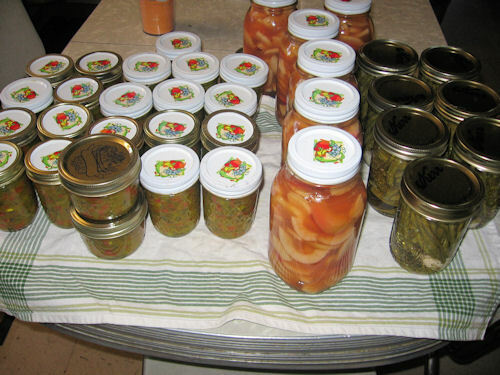 So we took advantage of the cool weather and went nuts canning. 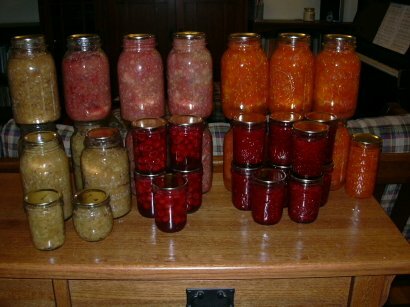 Today’s totals = 9 jars of raspberry jam, 5 jars of whole raspberries, 7 jars of tomatoes, 12 jars of applesauce (five of raspberry-apple and the rest cinnamon-apple). 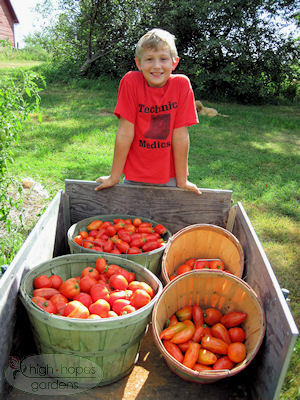 The tomatoes and applesauce are two of the most time-consuming things we can, and since it is the last day before school starts, I took advantage of the extra hands. We vowed to do more of our own food this year before selling it and we’re doing very well with that. 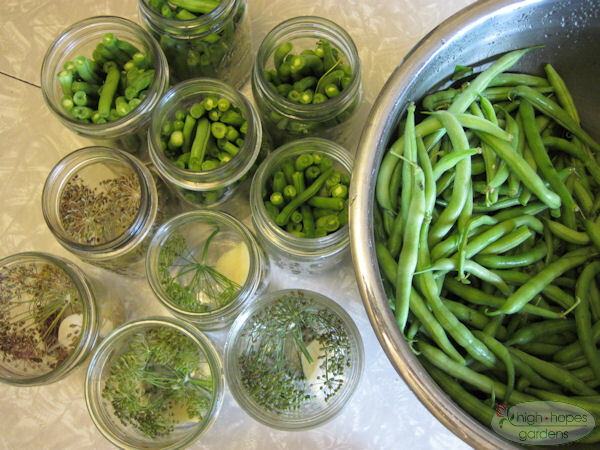 The freezers are filling up with veggies and fruits and we’re getting a little canned to save room in the freezers. 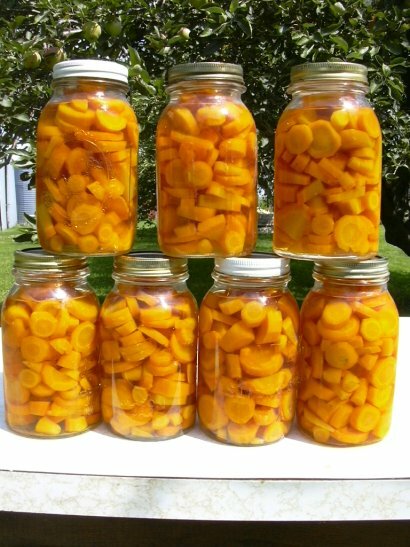 At 9:00 am these carrots were in the ground and by 1:00 they were out of the pressure canner. 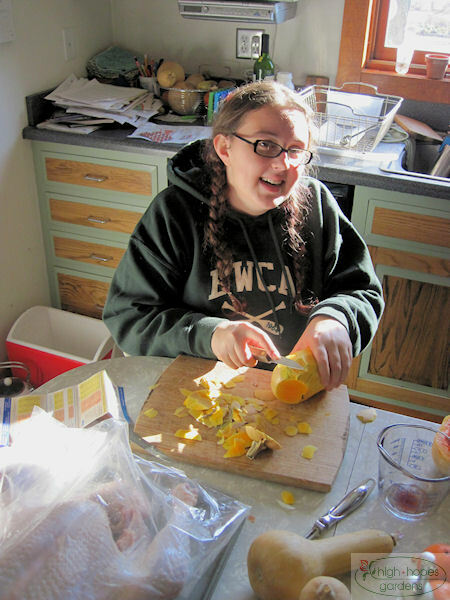 While I was messing with the carrots, Linda was chopping up and freezing the bruised and imperfect onions. So now, all we need to make chicken soup in the winter is a few hours of cooking time – the carrots and onions are all cleaned and peeled, and chicken in the freezer. It’s seemed a little bit like London in 1940 the last few days with the crop dusters buzzing around, especially when they are clearing the tree tops above our house by what seems inches. It’s amazing to watch them fly, but disconcerting knowing the imperfect applications of poisons they drop off. Watching the planes fly, I was wondering how many crash, and I saw in today’s papers that two have gone down this weekend, in a crop field in Green Mountain and in someone’s front yard in Osage.